Another Easter outing. I had a morning window of opportunity, I forget now why it was only a morning, no doubt I had some ferrying about of kids to do in the afternoon. For once I wasn’t up and out very early. 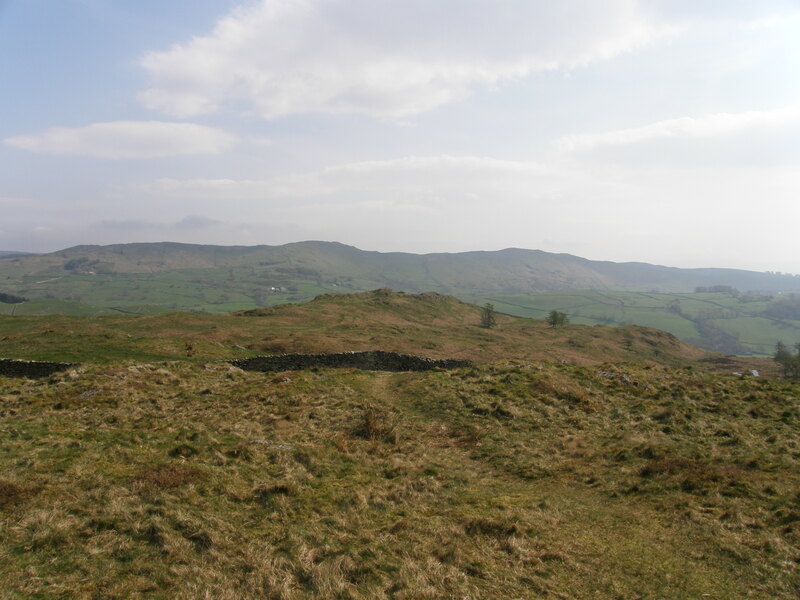 I drove to Staveley with a vague idea that I might climb Brunt Knott and a hazy feeling that I didn’t really have time. 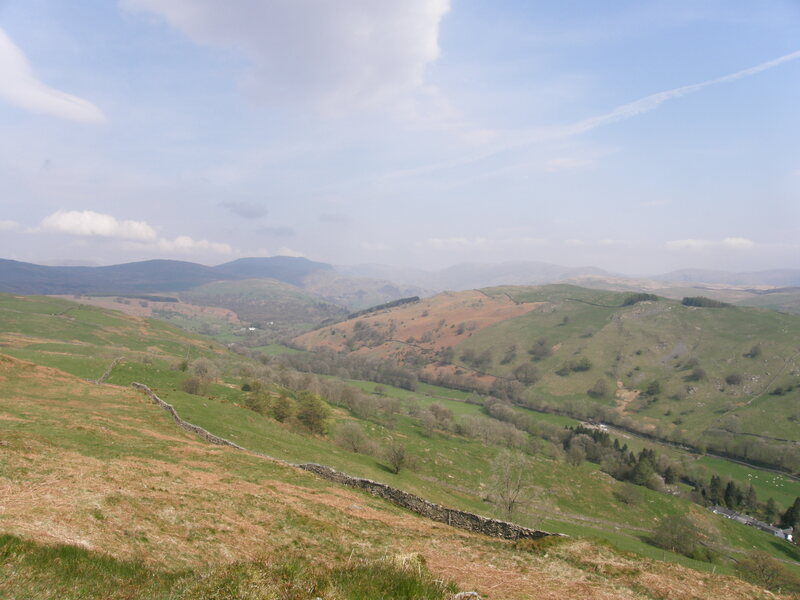 By the time I reached Staveley I was convinced that I definitely didn’t have time. So I went for plan B. 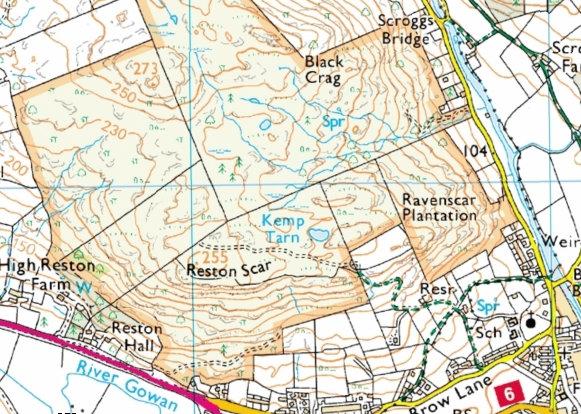 If you’ve driven up to the Lakes on the A591 you’ll know Reston Scar, even if you aren’t familiar with the name – it’s the steep and rather attractive looking little hill which sits behind Staveley. 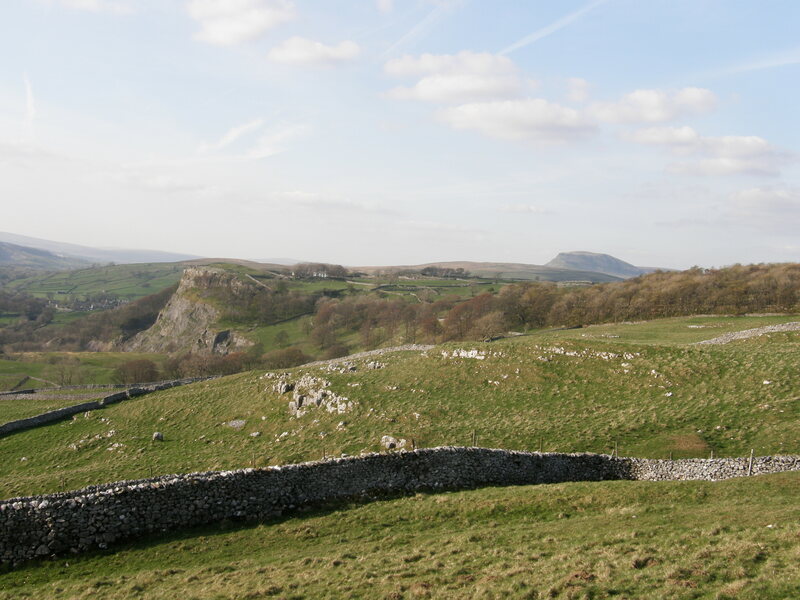 View North from the summit of Reston Scar. 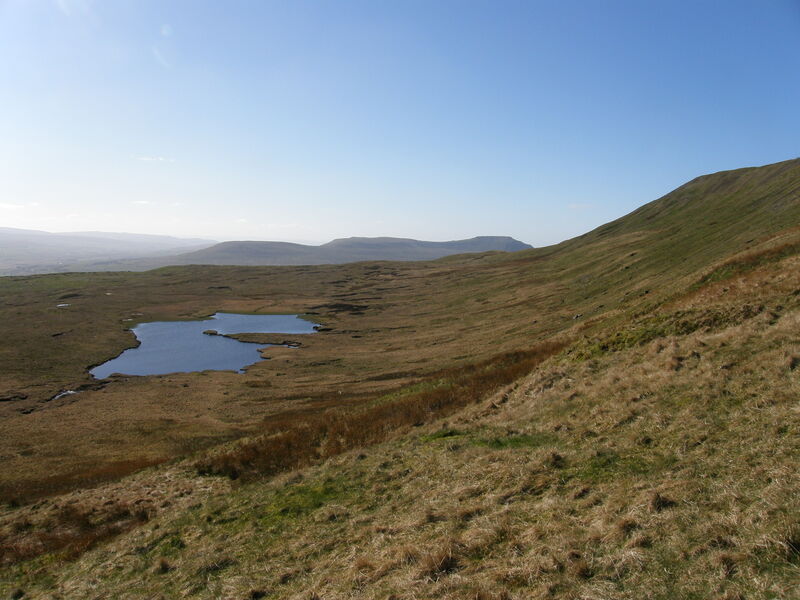 Not much to say about this one really – it’s a cracking little walk. The weather wasn’t as pleasant as the blue sky in the photos might suggest – there was a cold and heavy wind blowing. 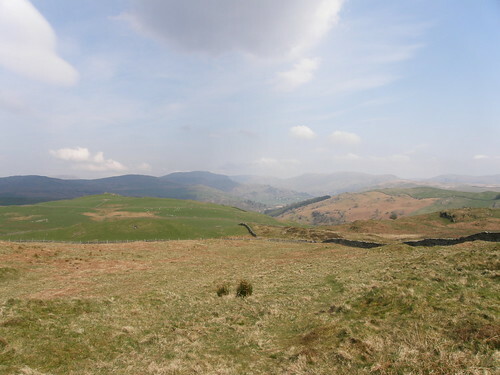 The hill in the middle distance, with the Kentmere fells behind, is what I’ve taken to be Hugill Fell (spot height 273 on the map). 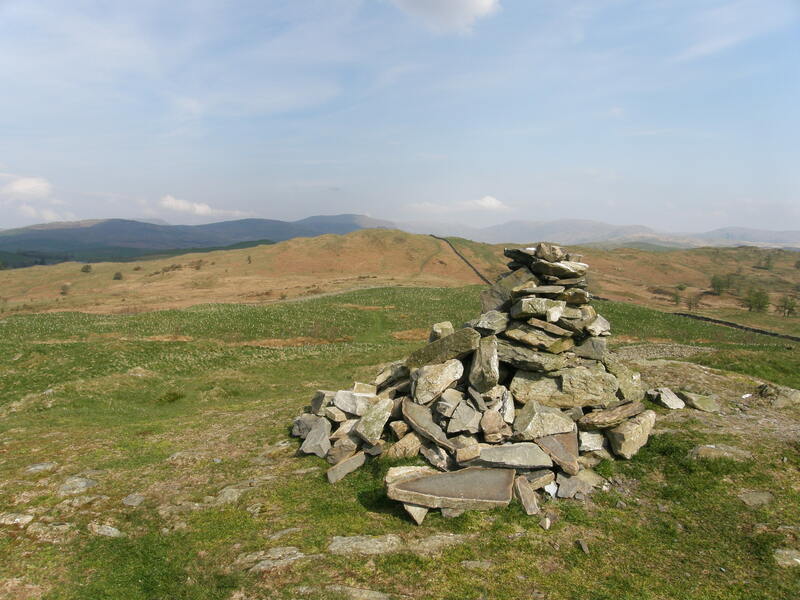 It’s not the summit which Wainwright describes a walk to in ‘The Outlying Fells of Lakeland’ which is just off to the right of this photo, north of where it says ‘Black Crag’ on the OS map below. 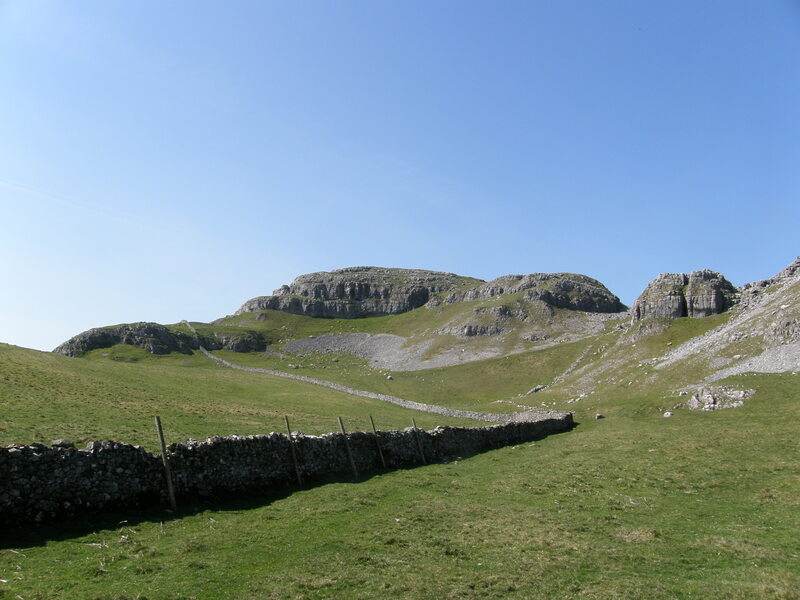 Wainwright says that it’s not possible to walk between these hills, but this is now access land, and there are convenient gates so a short circular walk is possible. 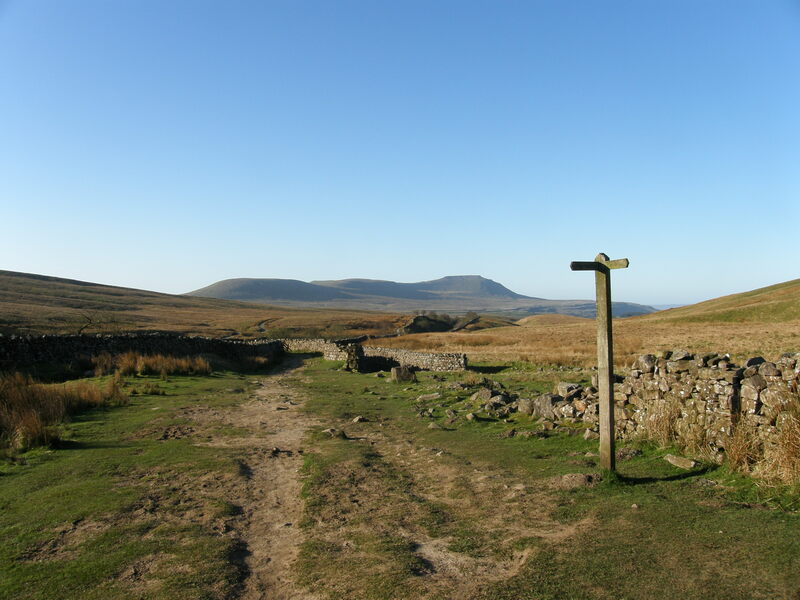 High Knott – another ‘Outlying Fell’ is the very green expanse on the left. 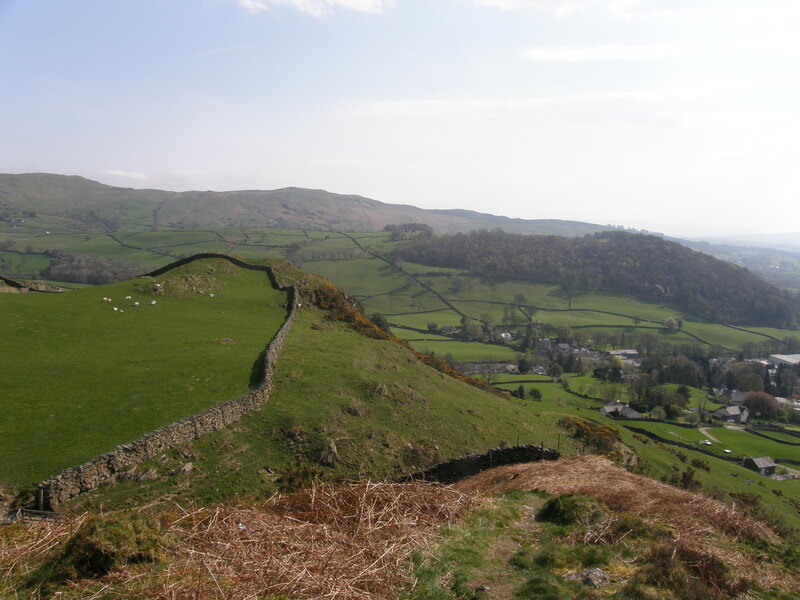 Wainwright’s Hugill Fell viewpoint (or Black Crag? ), Potter Fell behind. 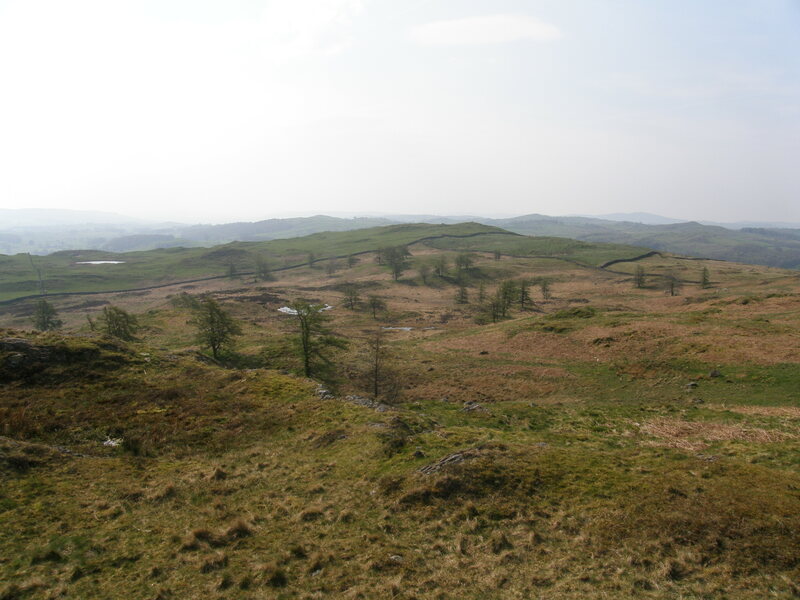 This is a pleasant round, but worth bearing in mind that there is one short, but very boggy section on the way across Hugill Fell towards it’s eastern arm. 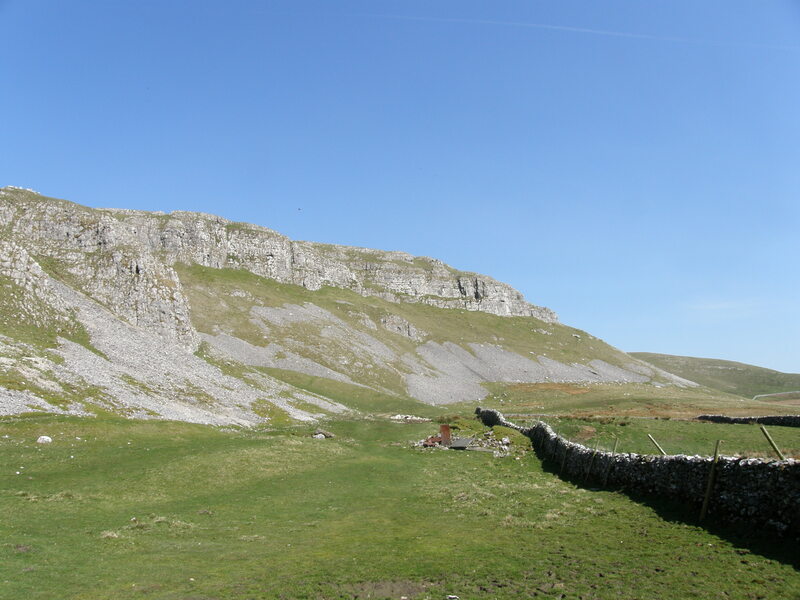 Looking back to Reston Scar. 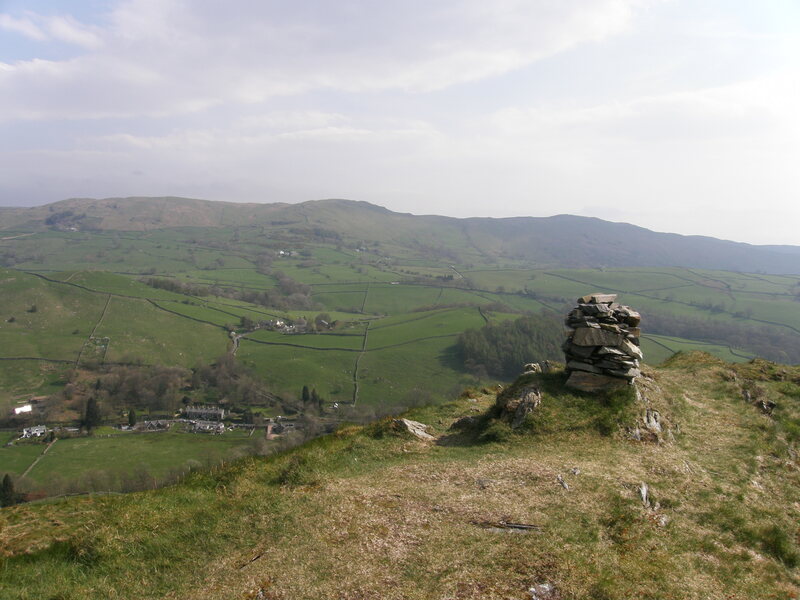 I dropped down the route which Wainwright recommends for Hugill Fell, the bottom part of which is marked as a track on the OS map. 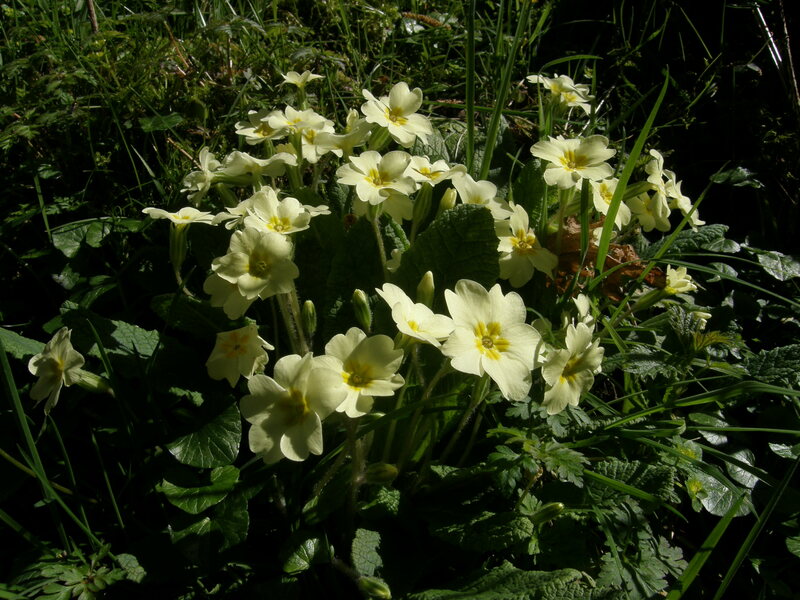 And which brought me down to a quiet lane beside the River Kent. A lovely way to spend a morning. Or an evening I would hazard to suppose. I can see myself doing that again. 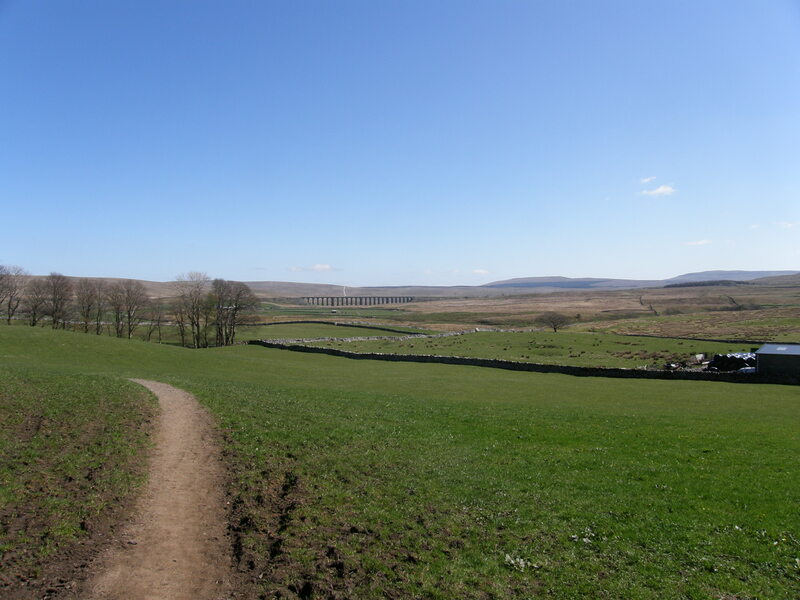 So, here I was, back at Ribblehead, with a bit of time on my hands, clear blue sky overhead and wall to wall sunshine spreading its munificence to one and all. 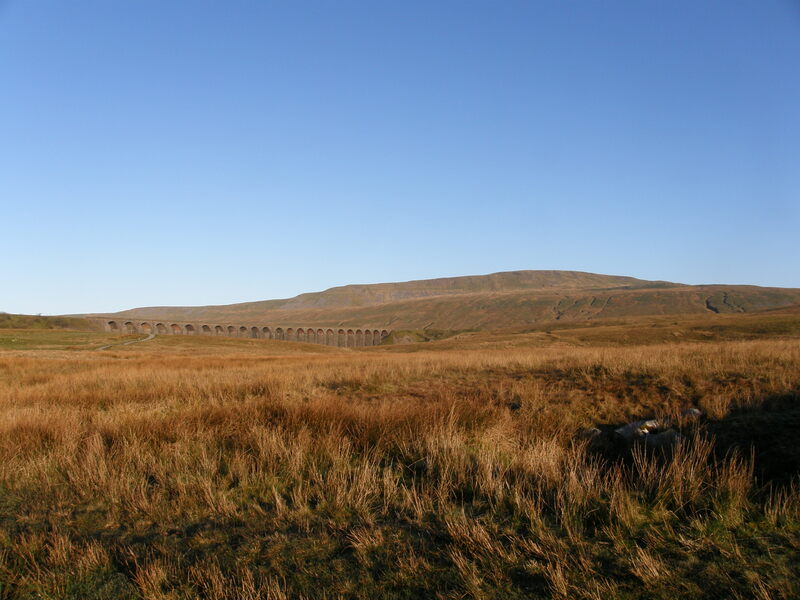 And when I say ‘one and all’, I do so advisedly, because, in stark contrast to how quiet it had been at seven thirty, Ribblehead was now thronged with people. 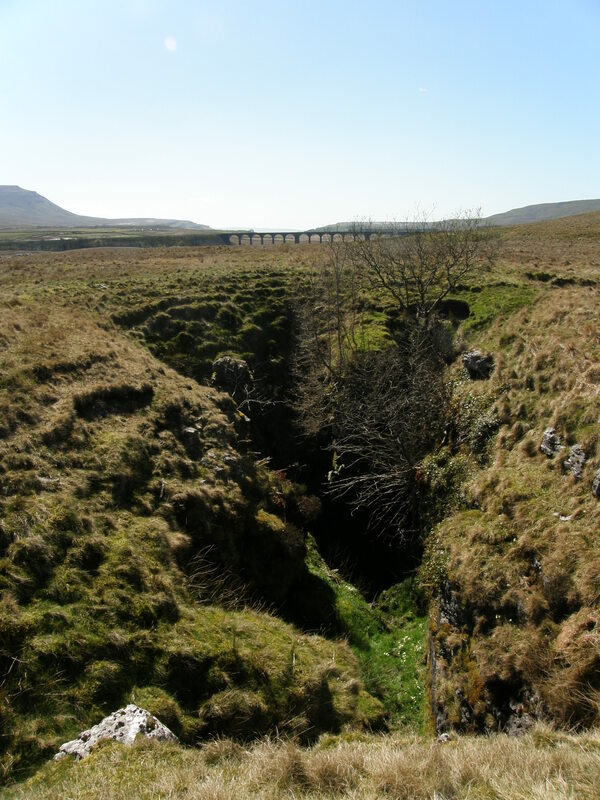 I had ‘Walks in Limestone Country’ in my pack: I had a bit of a shufti at that and decided that Walk 22: The Caves of Ribblehead, or at least part of it, was just what was required. 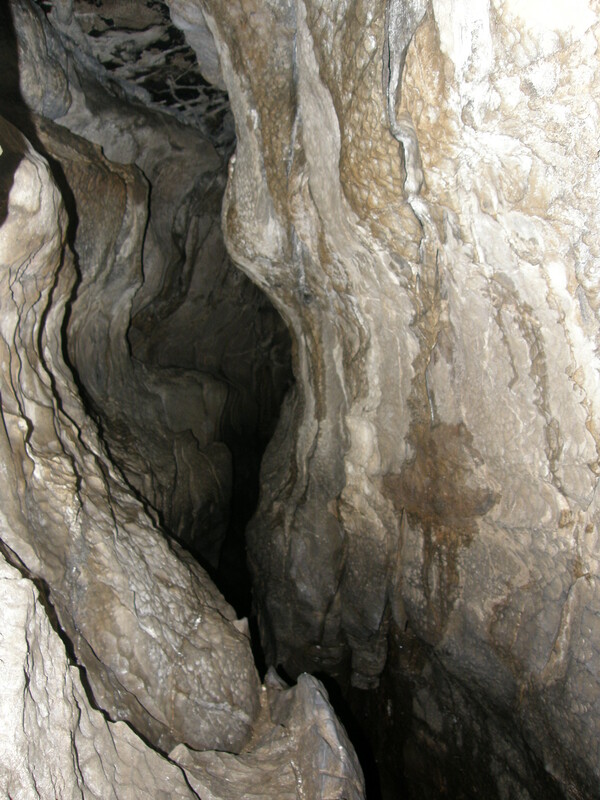 This is one of several entrances to Roger Kirk cave. I didn’t venture into this one, and now that I’ve read a little more about it*, I’m happy with that decision. 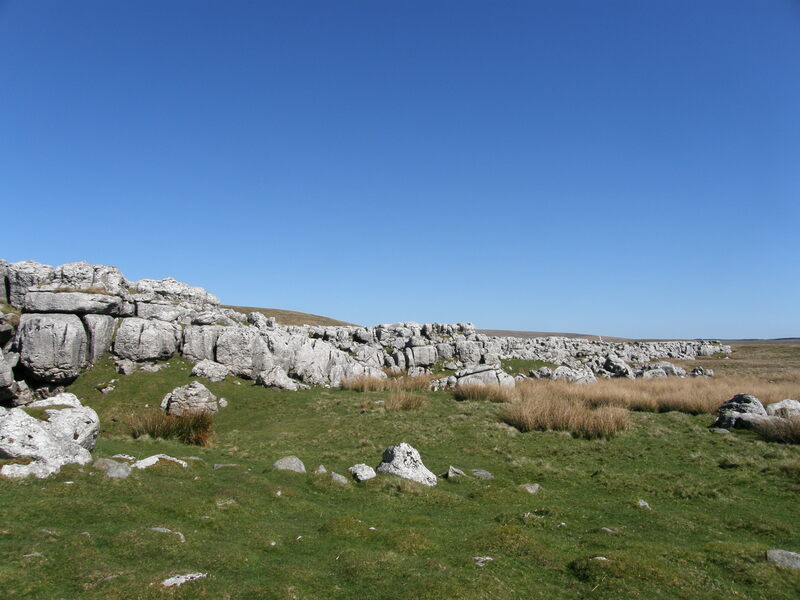 Runscar’s clean white rocks add interest to what otherwise might be a rather bleak stretch of moorland. 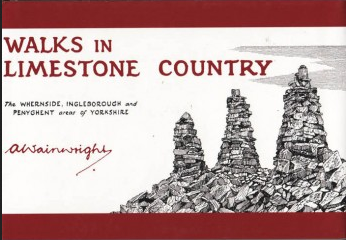 I couldn’t find all of the cave entrances which Wainwright mentions, but, disconcertingly, found some that he doesn’t mention. 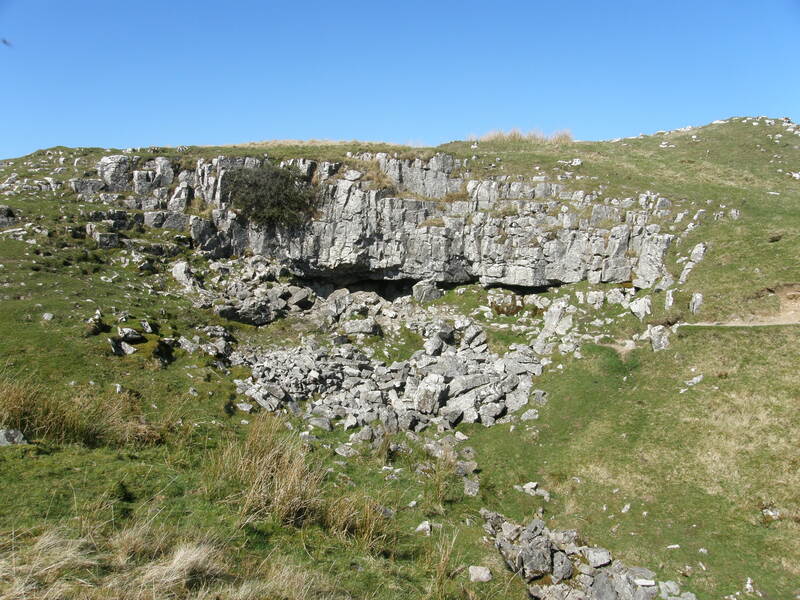 Both Thistle Cave and Runscar Cave have upper and lower sections. 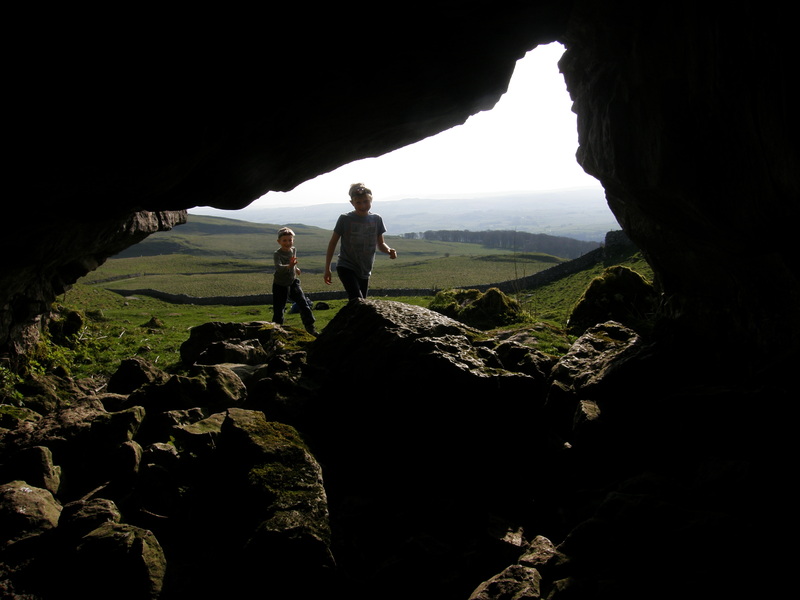 I didn’t find the top entrance to Thistle, but I had a good poke around in Runscar Cave. Which was most enjoyable. 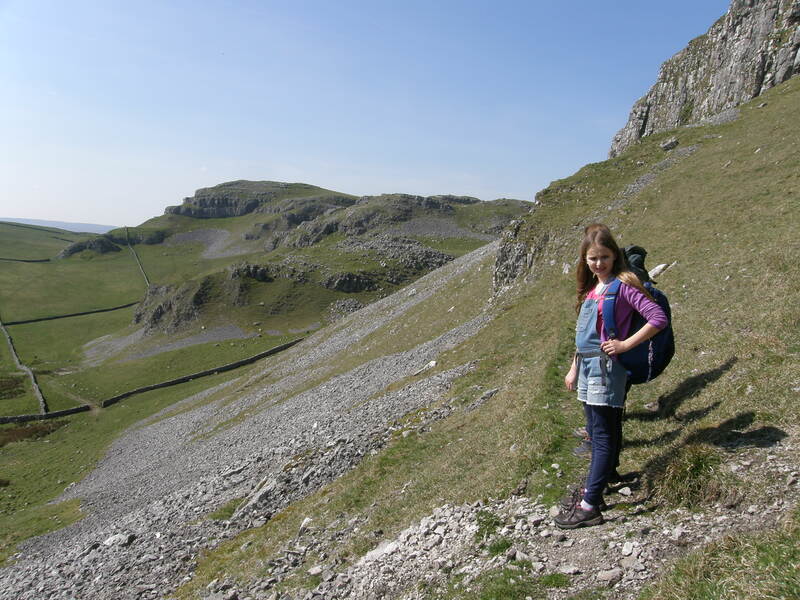 Then I was across the limestone pavement (Penyghent in the background)…. 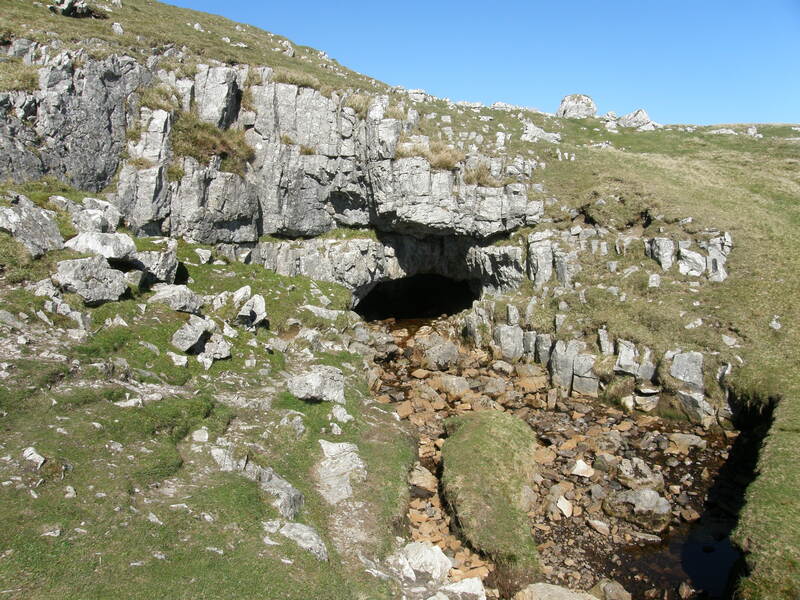 Not far from the pothole, and upstream, is Cuddy Gill Cave, which also has a number of entrances. 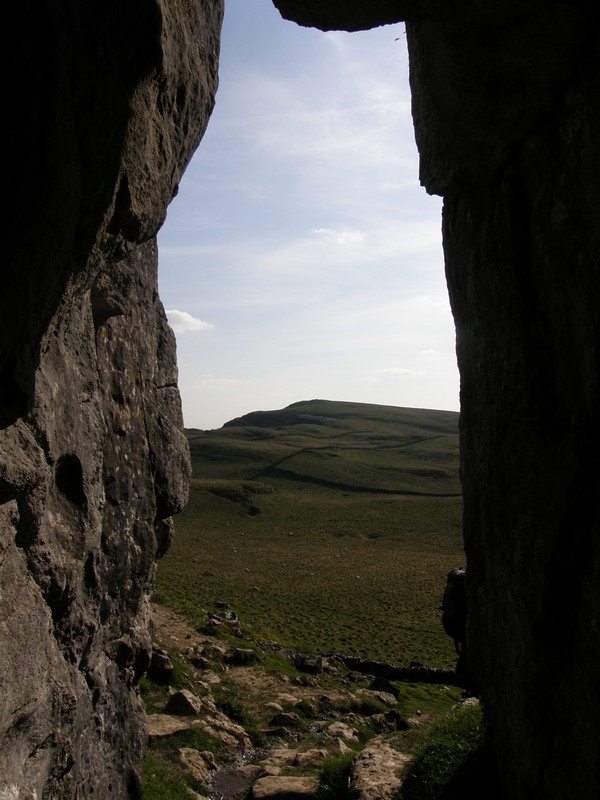 I had a bit of a look in there, but it’s narrower and the rocks are sharp edged, and to my mind, worth a look, but not as satisfactory as Runscar Cave. 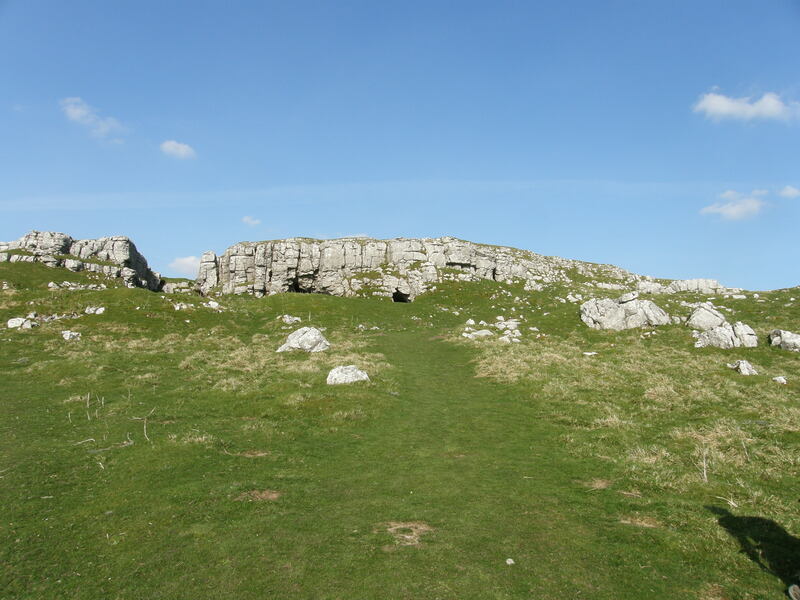 Turning back towards the car I came across this resurgence, which I now know is Runscar Cave again. I went in a little way, but when it looked like I might need to use my knees, decided that shorts are not the best attire for caving and left it at that. Must go back and have a more thorough gander sometime. I’d seen this tight cave entrance under a small bluff on my way out, but a lady with two dogs was sat nearby eating her lunch and it seemed rude to interrupt. I crawled a small way into it now, but, not knowing what I was letting myself in for, thought better of it. 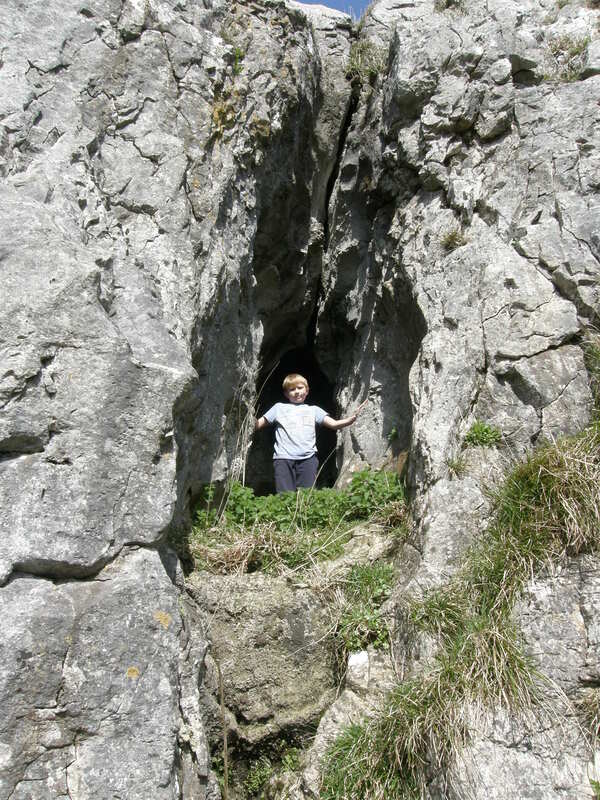 In fact this is the exit for the top section of Thistle Cave. A solo outing. 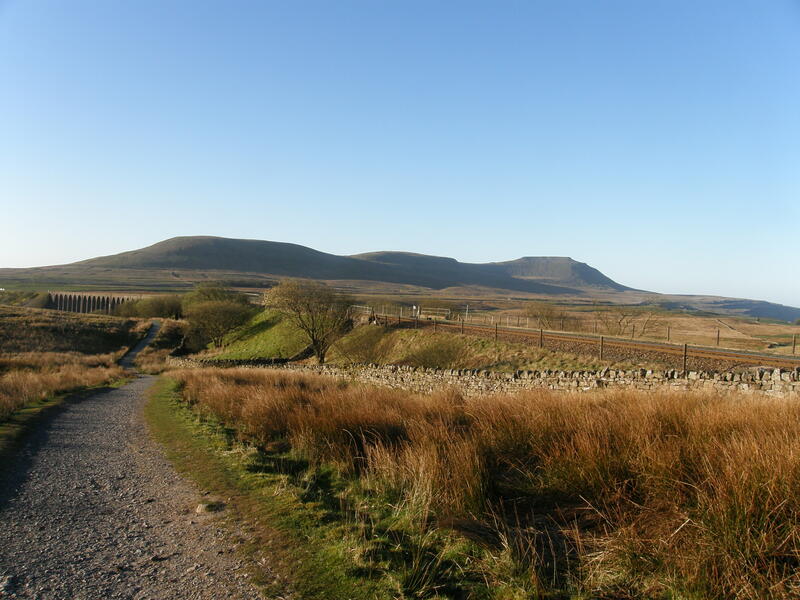 And one of my early morning starts – if I remember rightly, I parked up at Ribblehead at around 7.30am. It was, as you can see, clear and bright: very sunny, but also bitterly cold. 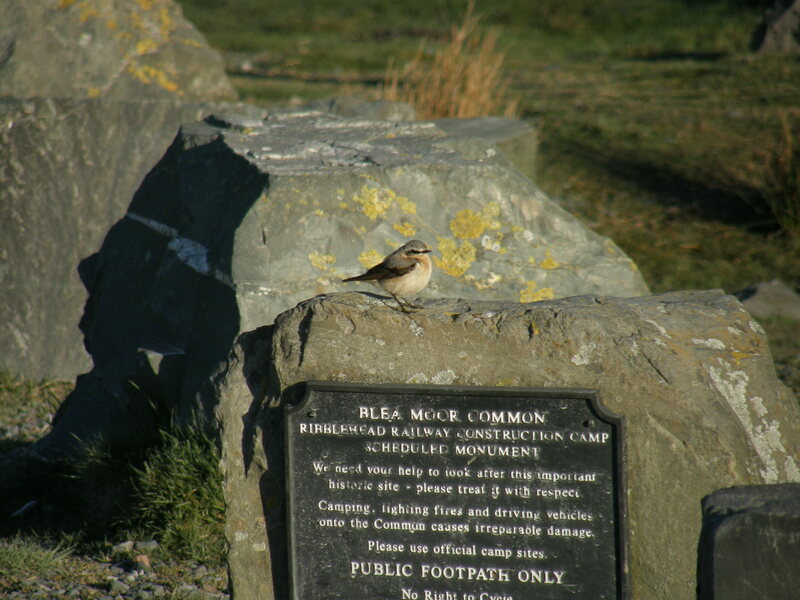 As I walked alongside the viaduct, I was distracted by a pair of wheatears, who posed for numerous photos – which turned out to be a bit of a feature of the day. I followed the railway line North towards Dent, stopping briefly to admire a tiny wren which was singing with great gusto from a sapling on the embankment. 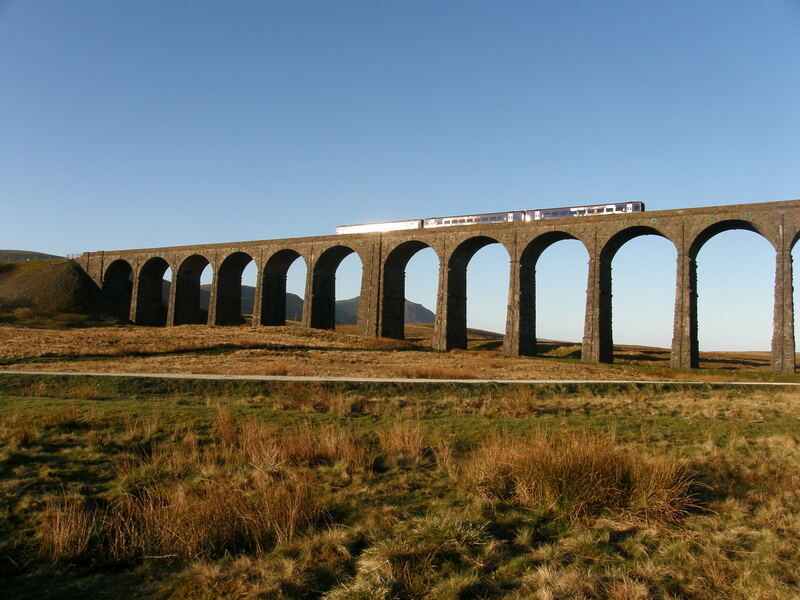 Handily, Force Gill crosses the railway line via an aqueduct and the path slips across the same way. 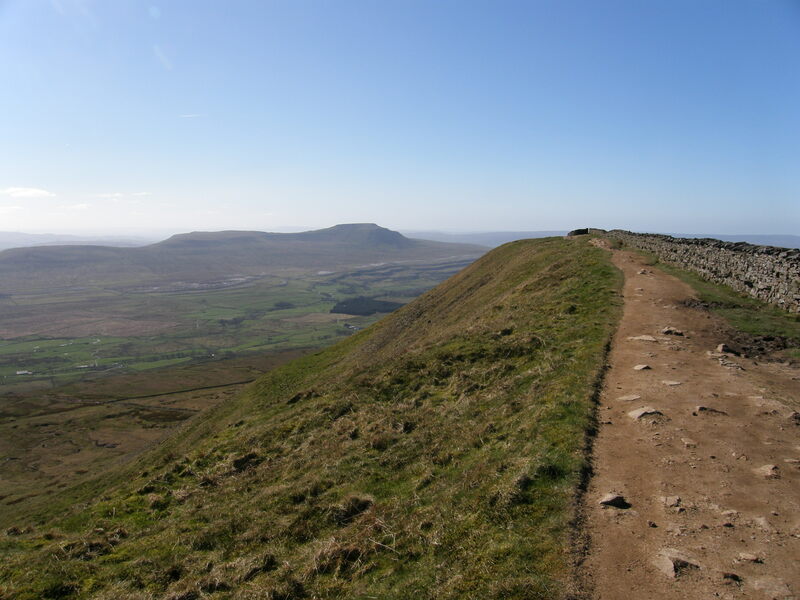 The path then climbs Force Gill Ridge towards Knoutberry Hill and ultimately Whernside. 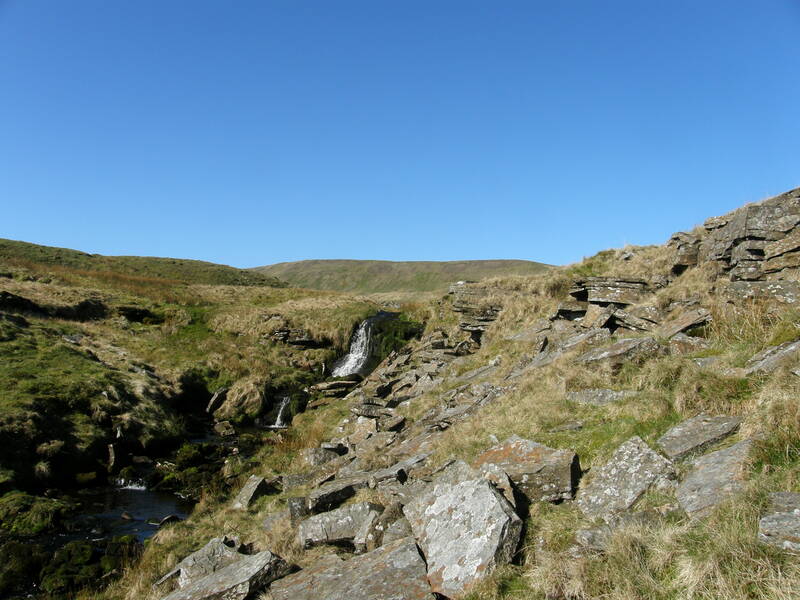 I left the path however, to follow Wainwright’s suggestion of an ascent beside Force Gill itself. 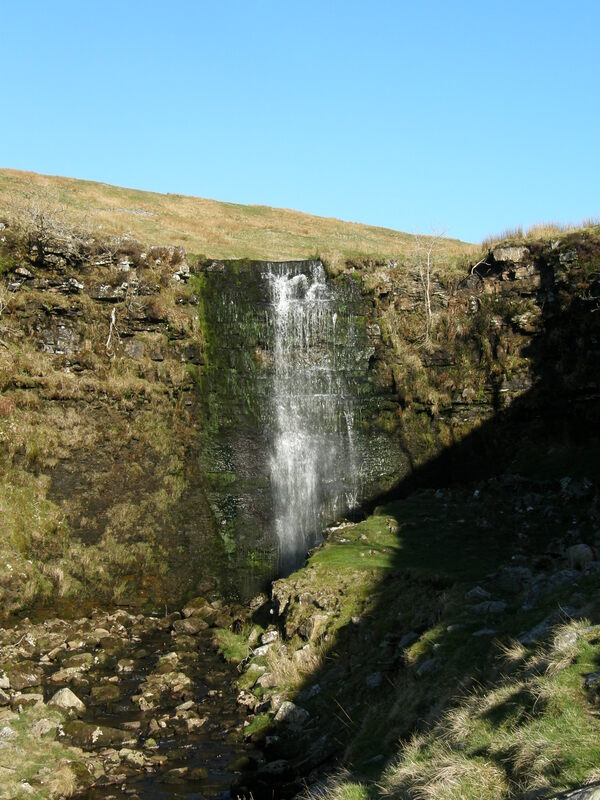 The immediate reward for such a choice is an encounter with ‘the lower fall’…. ..which is very impressive. 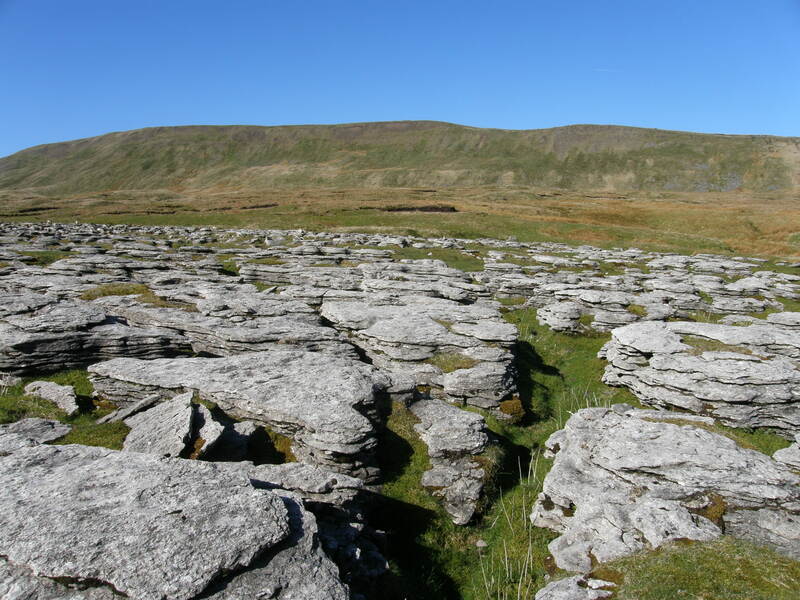 I’ve climbed Whernside many times over the years, why don’t I remember seeing this before? 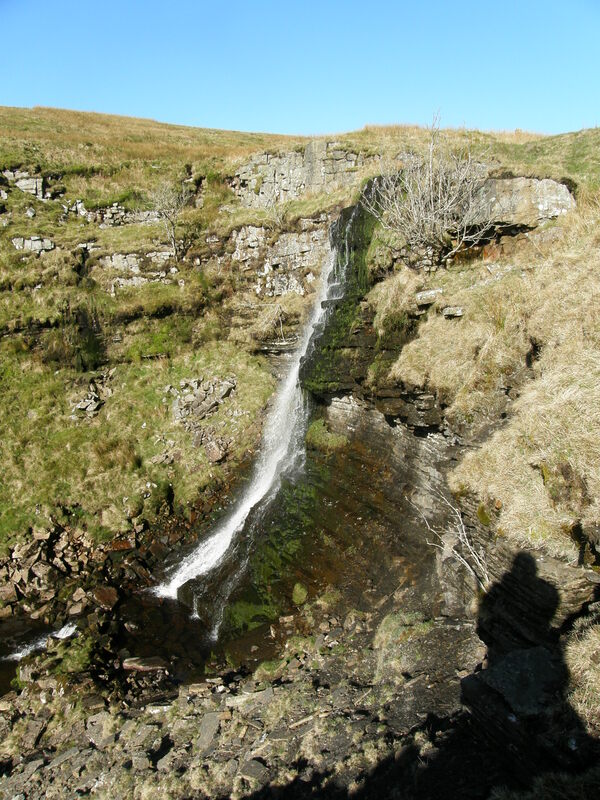 I watched a dipper which seemed to disappear into a spot near the top of the falls. This was the first of several dippers I saw, or perhaps the one dipper several times, or maybe a few dippers a few times each. Whatever: they’re birds I associate with mountain streams and I’m always pleased to see them. 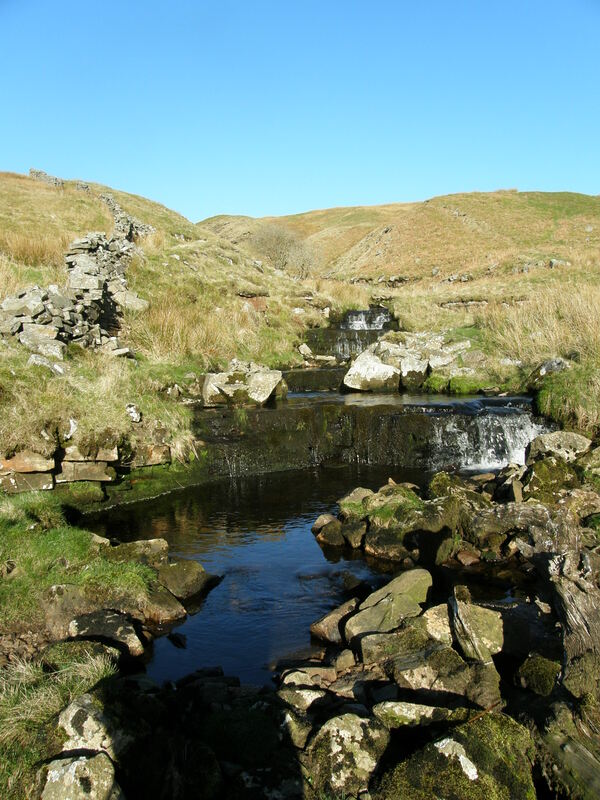 The stream was a delight to follow, with many small cascades and falls. I suppose progress was slow – I took lots of pictures and, where the banks closed in a little, found myself frequently crossing the stream to find an easier passage – but then, what was the hurry? 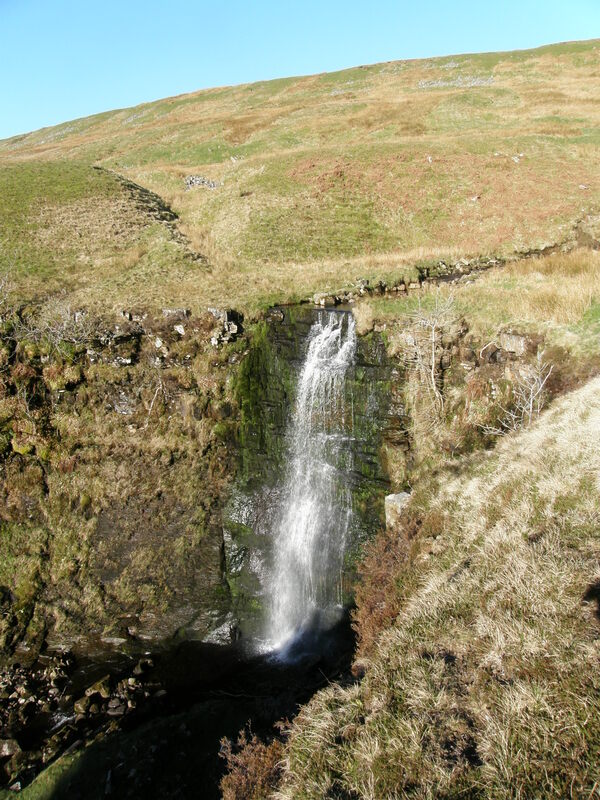 Soon enough, I’d reached the ‘upper fall’, which Wainwright calls ‘The Mare’s Tail’. This was a superb spot and since I had it all to myself and the sun was shining I decided to stop, break out my stove and kettle and have several brews. Once again I was entertained by wheatears – three of them were chasing each other around rather vigorously. 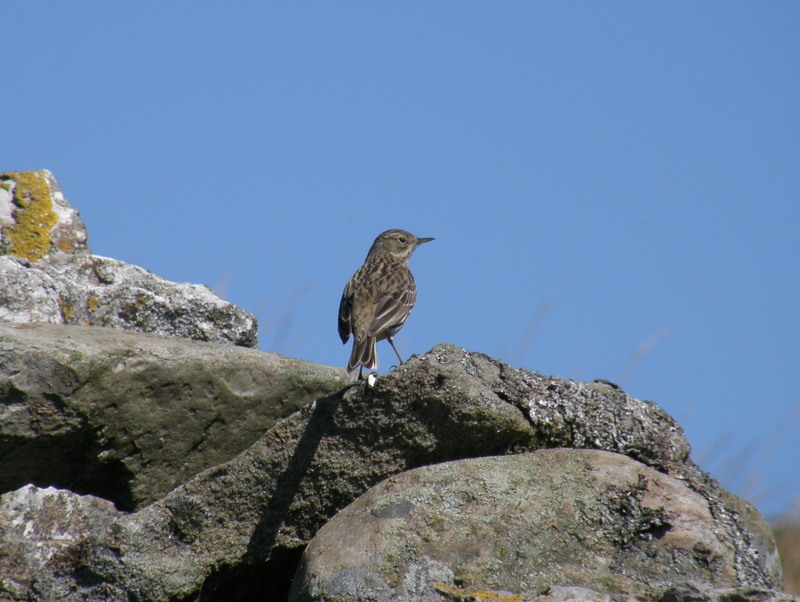 A skylark (or similar LBJ) joined them on the far bank for a while. 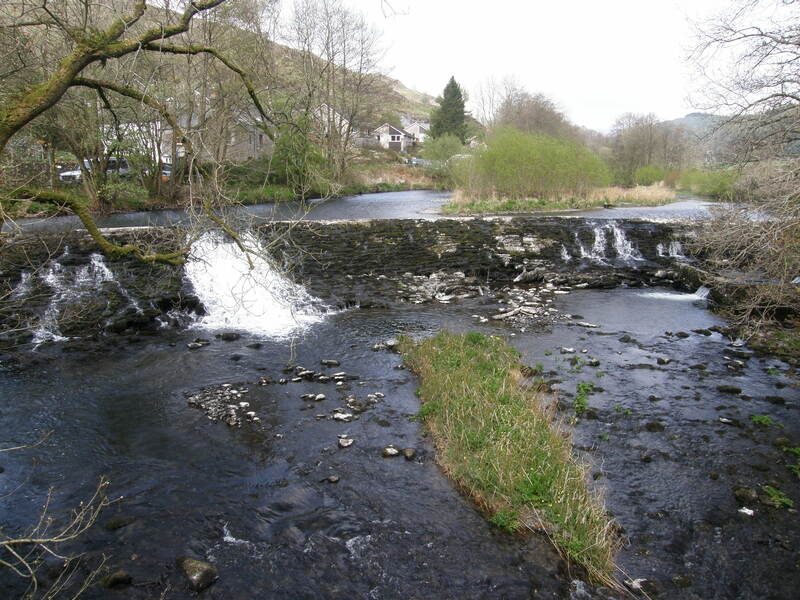 And another dipper seemingly disappeared into the rocks by the waterfall – a nesting site? 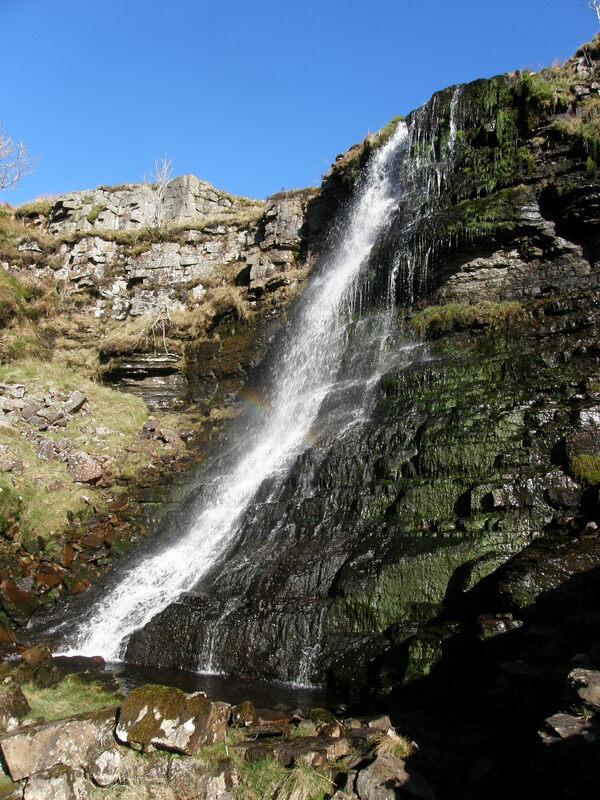 It was very pleasant sitting there, taking photos of the birds and the waterfall and the miniature rainbow in the spray near near the base of the falls. It took me quite a while to decide to move on and climb past the Mare’s Tail. 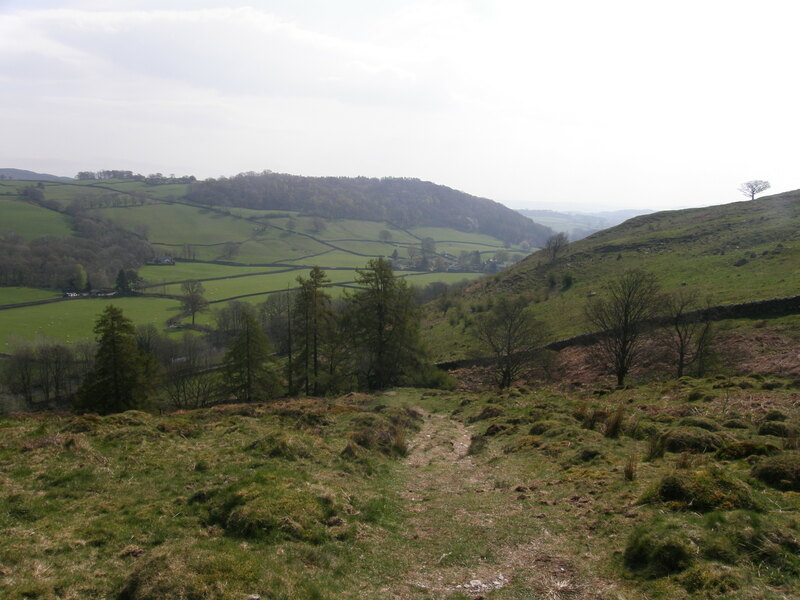 I got a bit of a shock when I did, because now I could see the main path above and to my right and see also the steady stream of bobble-hatted hikers, lead-dragged dog-walkers, Lycra-clad runners, and bike-wielding mountain bikers who were variously promenading to the top. 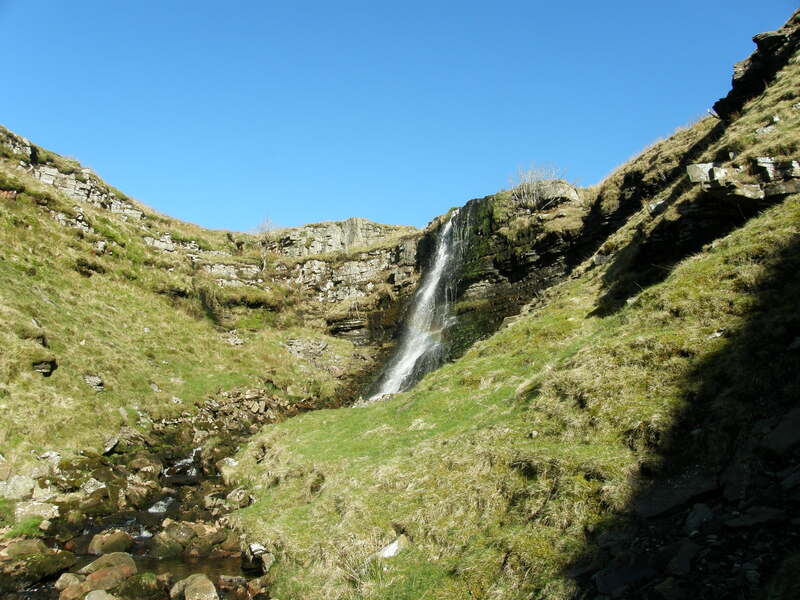 The quiet of Force Gill had me suffering the delusion that I had the hills all to myself, but nothing could have been further from the truth. Not to worry: I still had a little more of the stream to enjoy. I was quite surprised to be regaled by another enthusiastic wren which was perched on a mid-stream boulder. I can’t help thinking that wrens are garden or hedgerow birds and therefore a little out of place so high in hill-country. 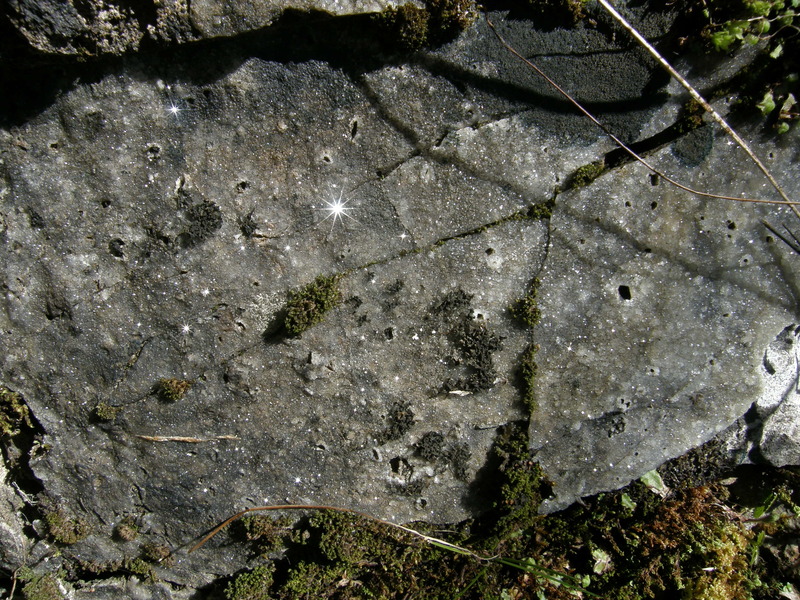 …and some potholes too, though I didn’t find those. 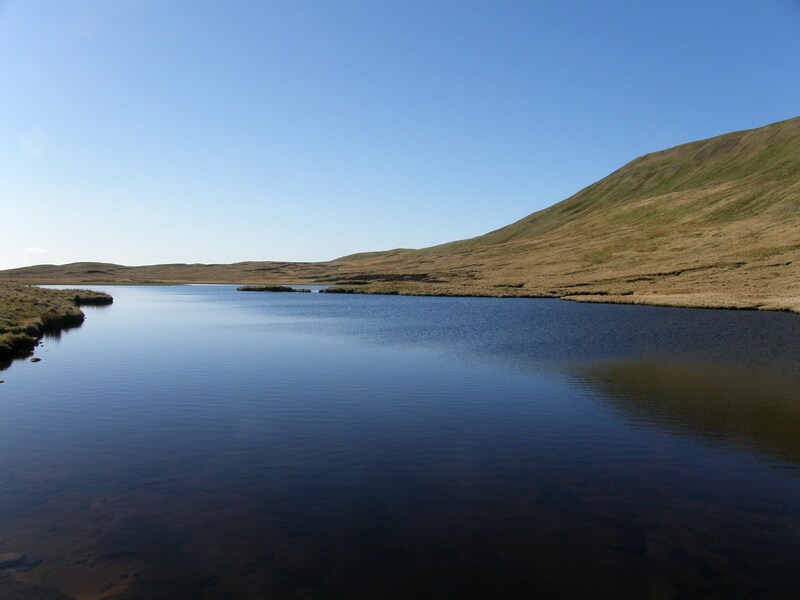 Perhaps the reason why the crowds were all further north on the flagged path is the fact that the area around Greensett Tarn…. ….is very wet and boggy. It is called Greensett Moss and the word Moss in a place name never leads one to anticipate sand dunes, wadis and distant caravans of camels. A short steep climb brought me on to the highly populous path and since the chill of earlier was decidedly banished, I waited for a lull in the convoy and switched my trousers for my temperature-regulation ultra-high air-permeability leg-wear - otherwise known as shorts. 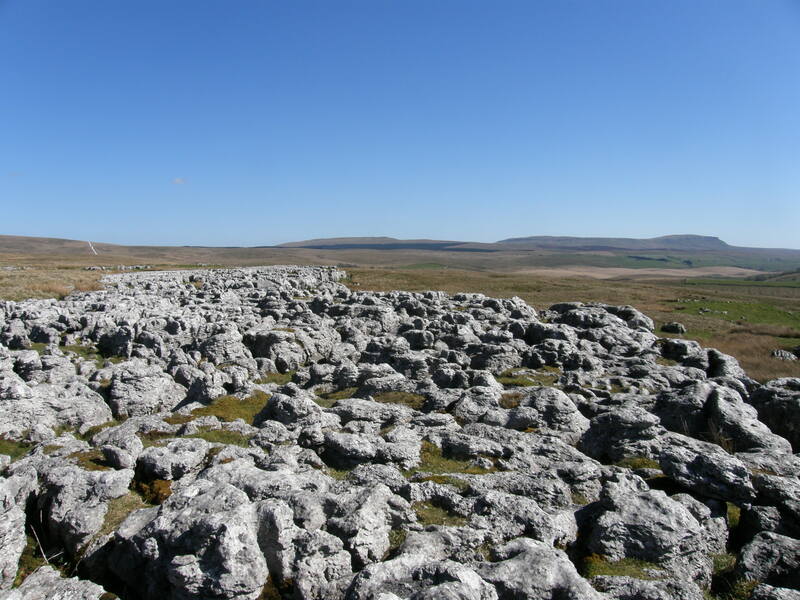 There’s a little walled shelter by the trig pillar on Whernside, and fortuitously, nobody was using it. Out of the wind there it was really quite warm. Soon the kettle was humming again and all was right with the world. There were quite a few people about: there seemed to be a bicycle maintenance class in progress, and a small party underway nearby, but a couple who joined me in the shelter told me that I was lucky to be there on such a quiet day, when no charity Three Peaks walks were mobbing the area. Wainwright advocates a very direct route down from the top. 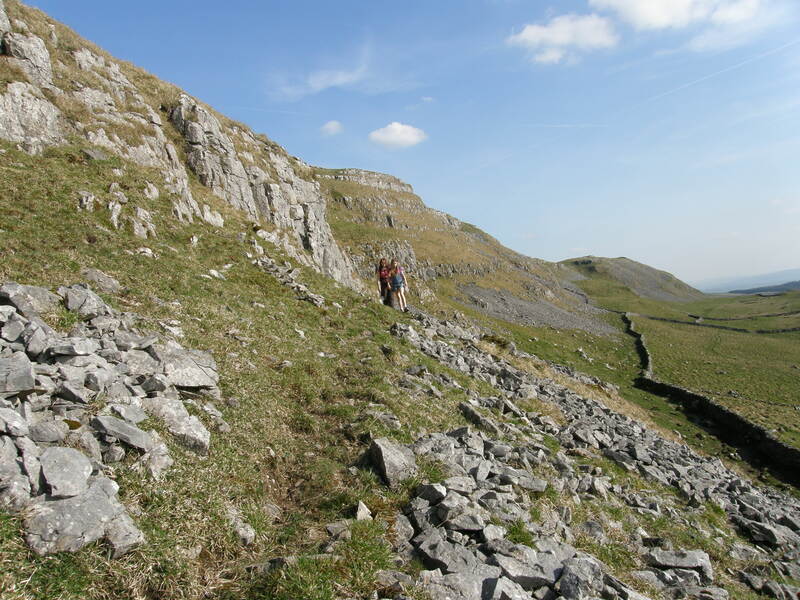 I opted for the main tread down the ridge a little and then steeply down into the valley. 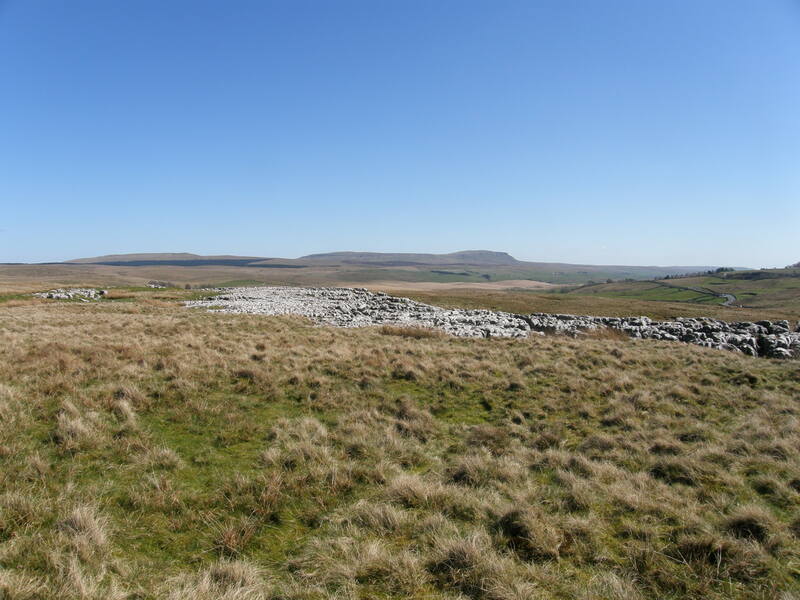 The wander back to Ribblehead via Broadrake, Ivescar and Winterscales Farm was balmy and butterfly blessed. This engaging bird posed quite obligingly on a wall-top. 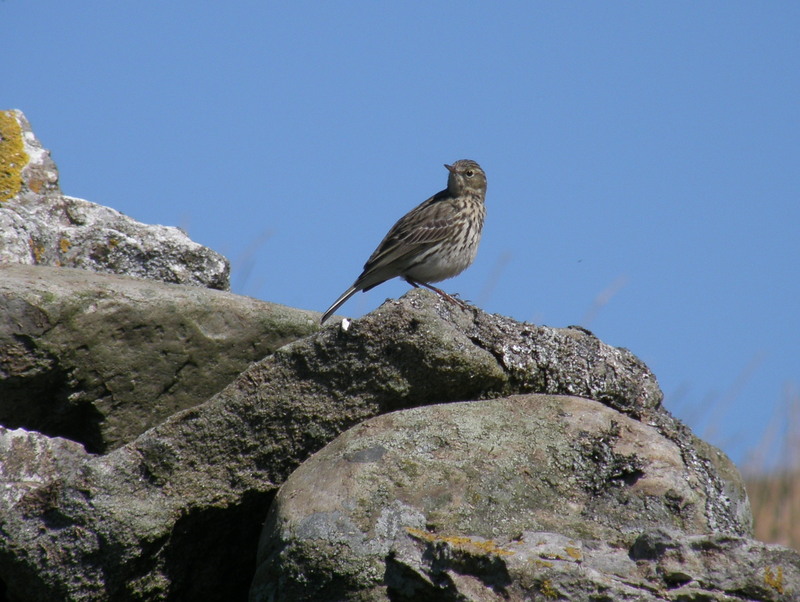 A meadow pipit? Soon I was back at the viaduct and having yet another brew. I’d promised to be home in time to cook tea, but the kids had been invited to a party and would be out all afternoon, leaving me with a fair bit of leeway. So – what next? …of which, more to follow. Our Easter fortnight started rather soggily. On my Birthday we lunched at Catch 23 (very handy for Junction 35 off the M6 and the food is terrific). The view over the fishing ponds showed heavy drizzle alternating with driving rain, but I was determined to get a walk in of some description and, fully water-proofed up, was dropped in Warton on the way home. My Mum was the only one daft enough to join me. As luck would have it, it stopped raining as we disembarked from the cars, and from that point on continued to brighten up. 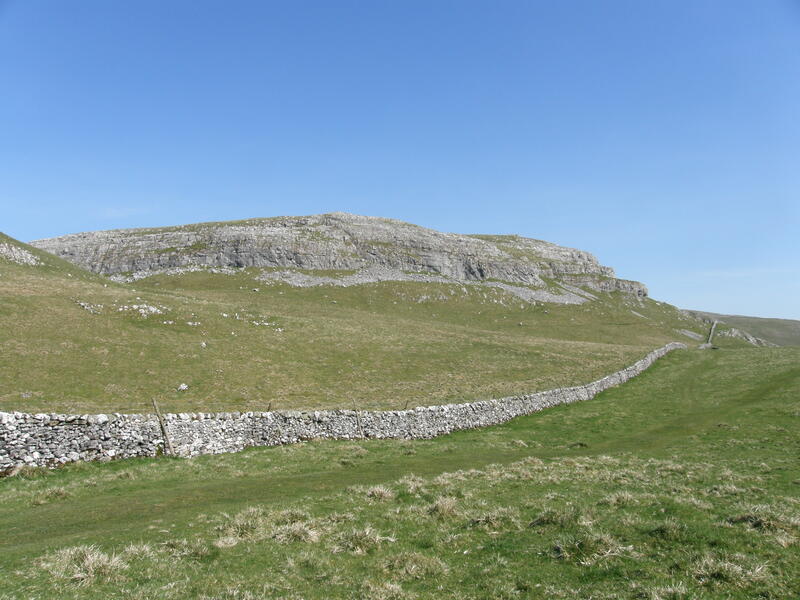 We had a smashing walk home via Warton Crag, Quaker’s Stang, Jack Scout and finally visited the Primrose Garden in the Limestone Pavement in Pointer Wood. Sadly, I didn’t take any photos, because I’d left my camera behind, anticipating continued rain. Fortunately, the weather didn’t continue that way. In fact we had just over a week of absolutely corking weather. We took the boys to Blackpool Pleasure Beach and managed to get sunburned. 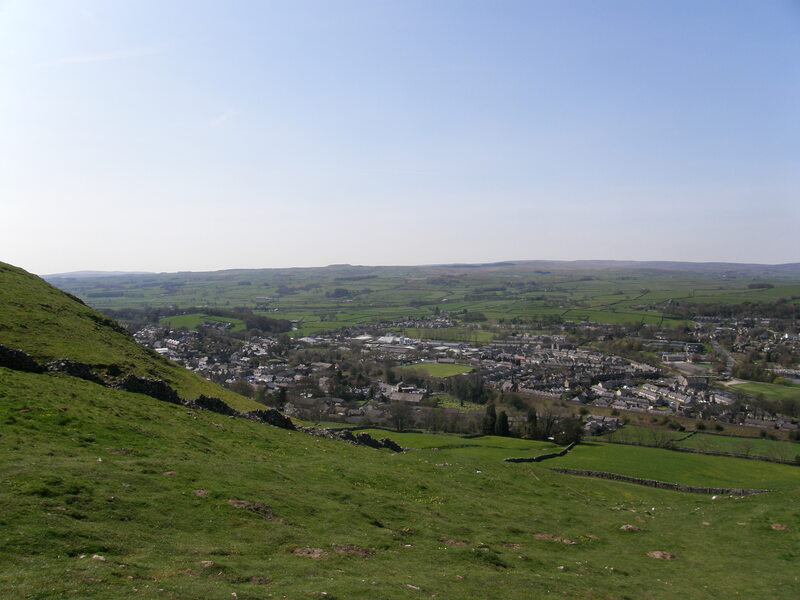 Looking back down on Settle. Settle was bustling with a small street market. 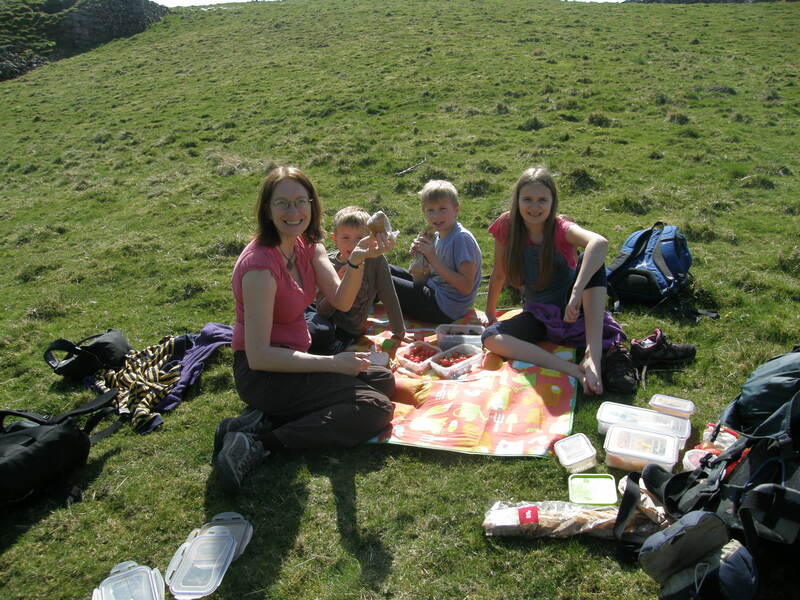 We picked up some unusual cheeses to supplement the picnic we’d packed and the boys each chose a pasty too. 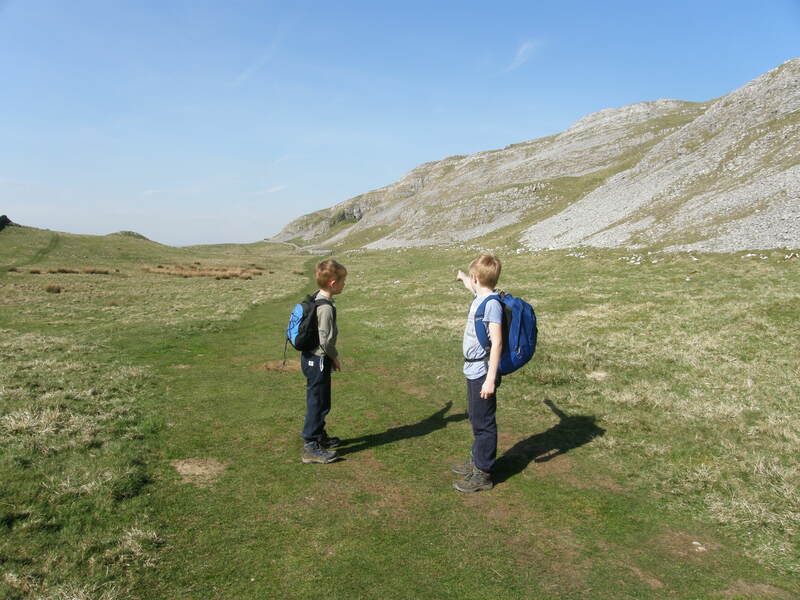 Climbing uphill on a hot day wasn’t universally popular, and the consensus was that we should stop for our picnic sooner rather than later. TBH is brandishing the Norwegian caramelised cheese we’d bought. It was sweet, rather toffee like and not to our taste. Fortunately, everything else was very tasty, especially the Isle of Mull cheese. First cave of the day. 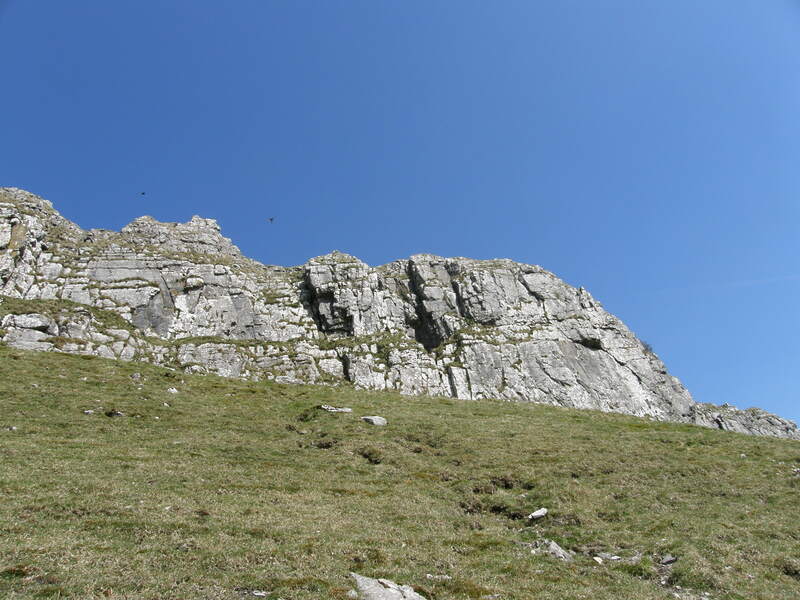 Warrendale Knotts and Attermire Scar. Looking back at Warrendale Knotts. The rusted lumps of scrap in the foreground here are the remains of a shooting range. 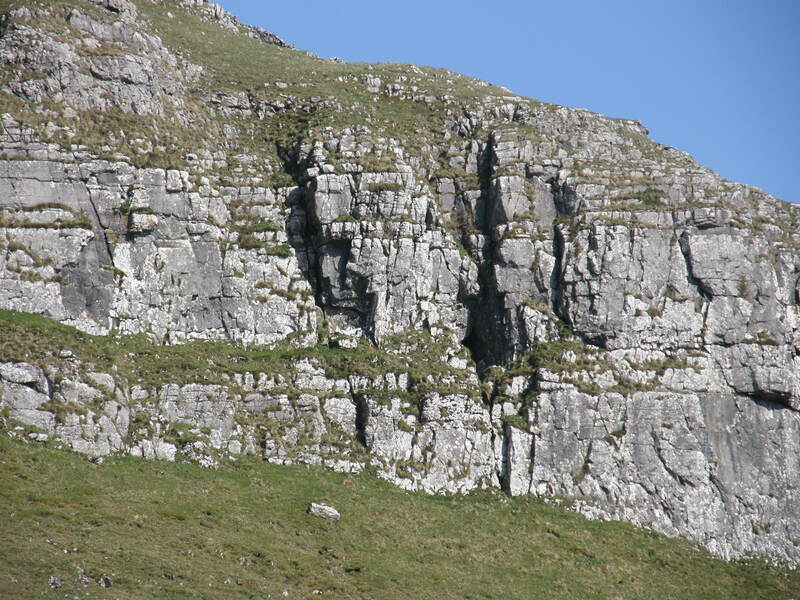 Towards the right-hand end of the scar you should be able to make out a tall, dark vertical fissure in the cliff. 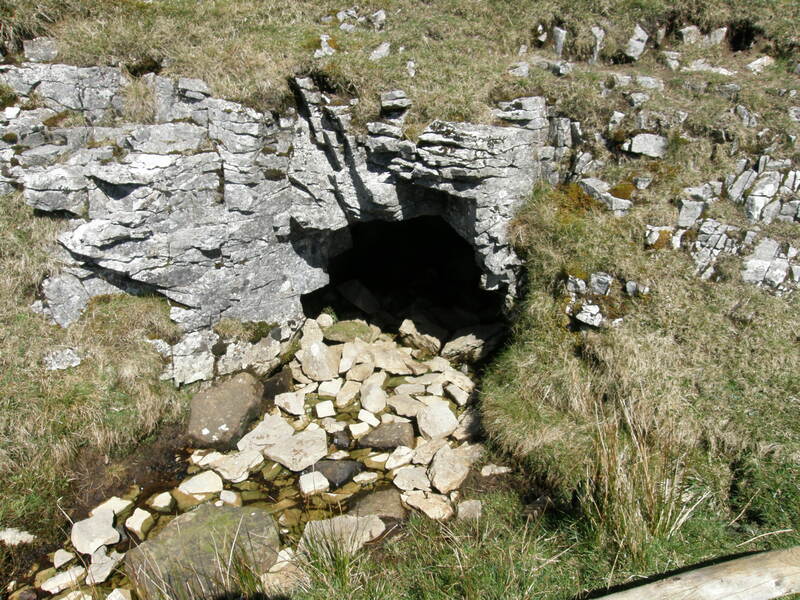 It’s Attermire Cave. I hope, but I’m not sure, that this conveys just how steep the ascent to the cave is. 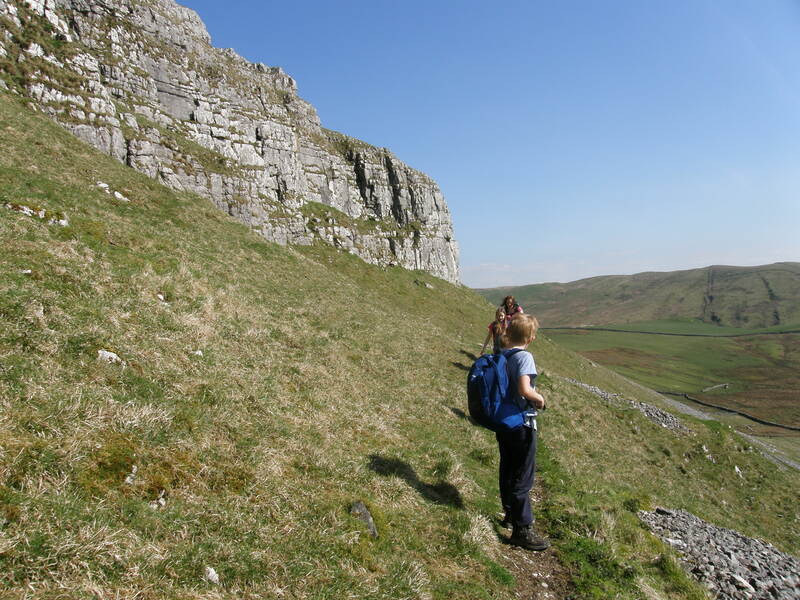 But it’s manageable, even with small ones, and the ledge which has to be traversed at the end is reasonably wide. On the ascent, looking back to Warrendale Knotts. 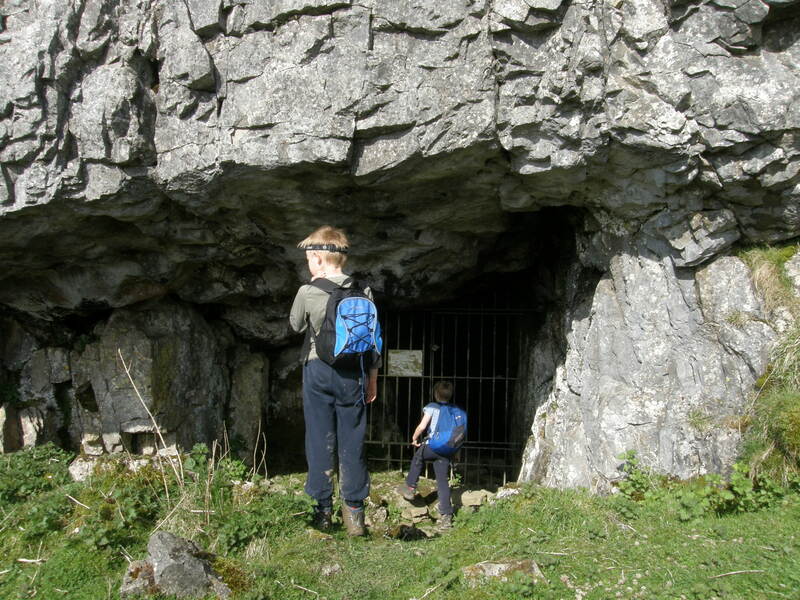 The entrance to Attermire Cave. The cave is quite long, we explored it a little. It has interesting physical features and a fascinating history (see Further Reading below). We did okay with our simple head-torches, but I struggled to get decent photos of the interior. When the cave got low, we turned back. 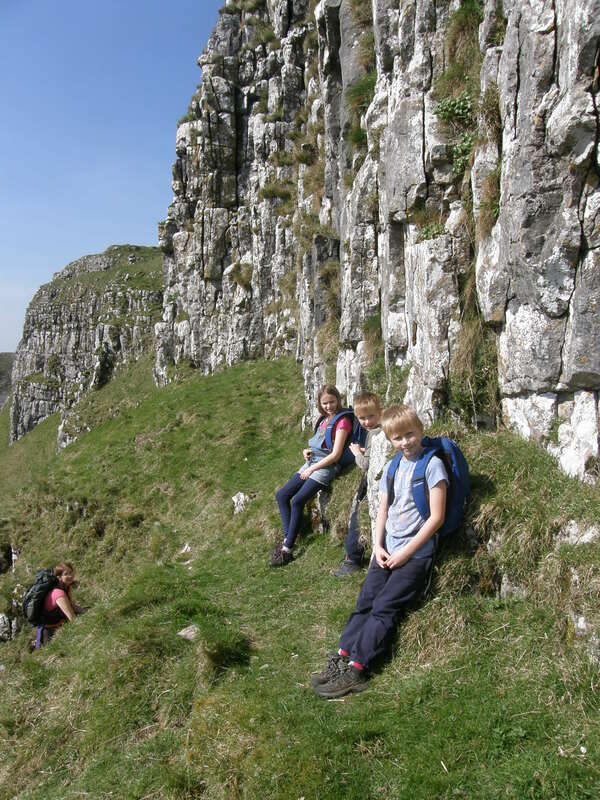 Rather than retracing our steps, we took a contouring path below the cliffs. I suppose I’m inured to the vertigo which steep ground brings on. I was a bit surprised to find that the kids were all a bit freaked out by this path, felt dizzy and wanted to take rests and sit down. I suppose it was a bit exposed. 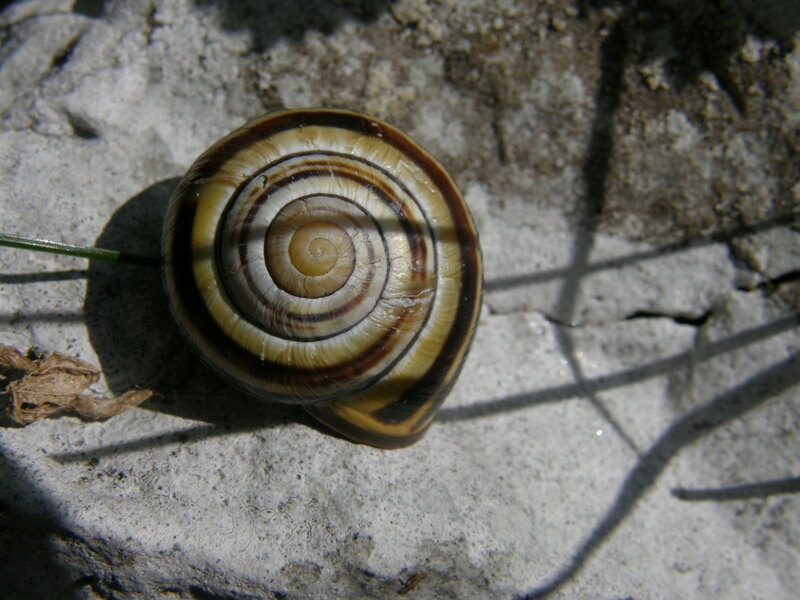 B wasn’t so intimidated that he didn’t point out to me the abundance of these colourful banded snails…. Eventually we reached the end of the ‘awkward’ section…. 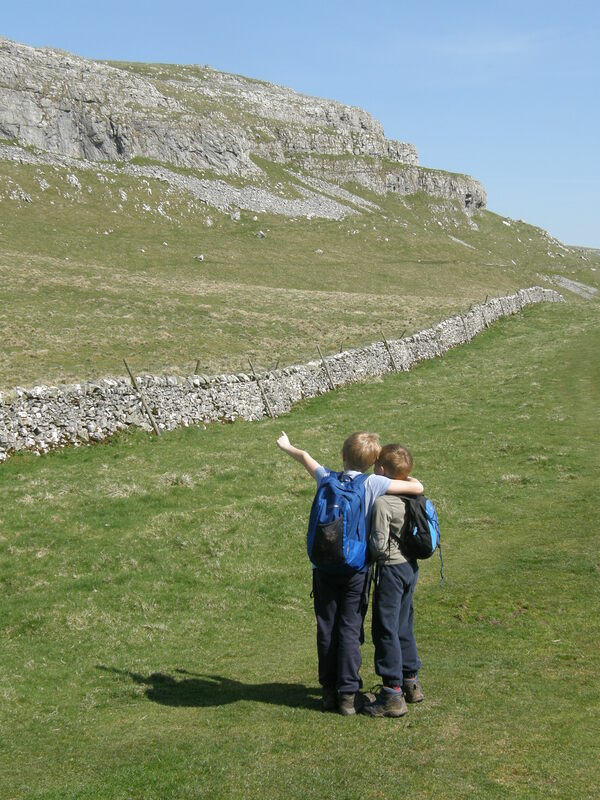 And soon the boys has spotted something ahead which had rekindled their interest…. We had a lengthy pause here, to do a little more exploring. 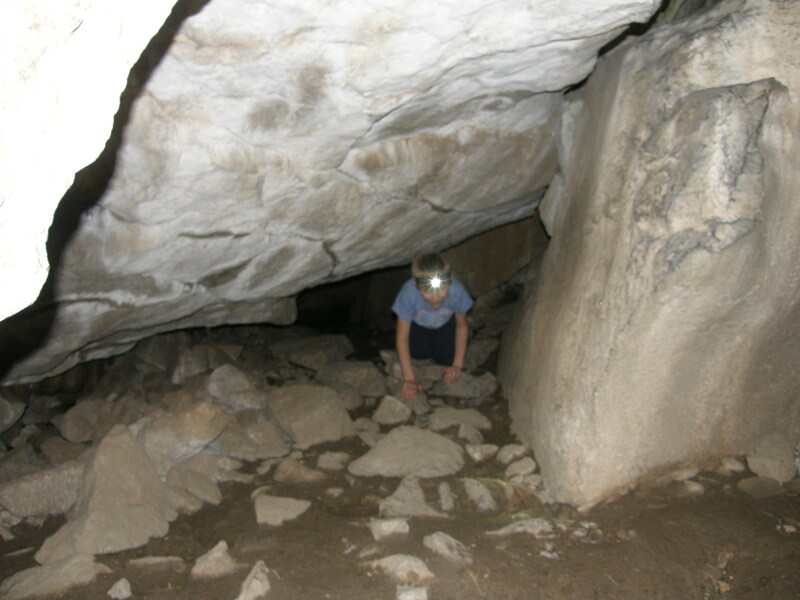 Again, Victoria Cave has amazing features and finds which show that it was occupied by bears, hyaenas, elephants and rhinoceros. There are several other caves nearby. 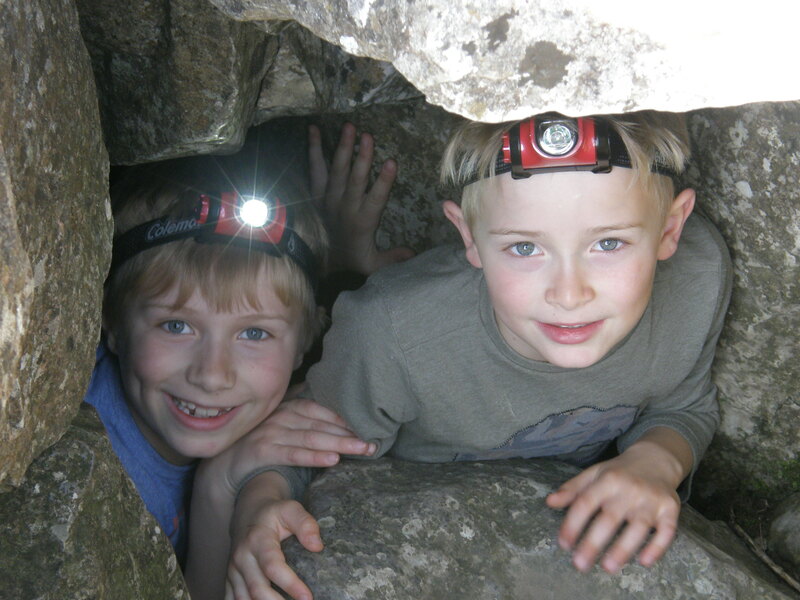 Here are the boys breaking-out their kit for Wet Cave….. Which was quite, well, wet….. 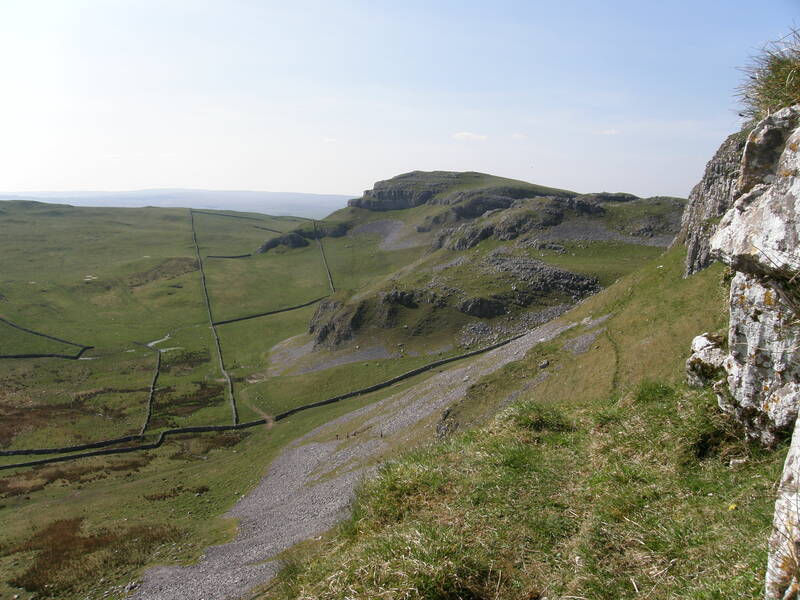 Looking back along the scar…. 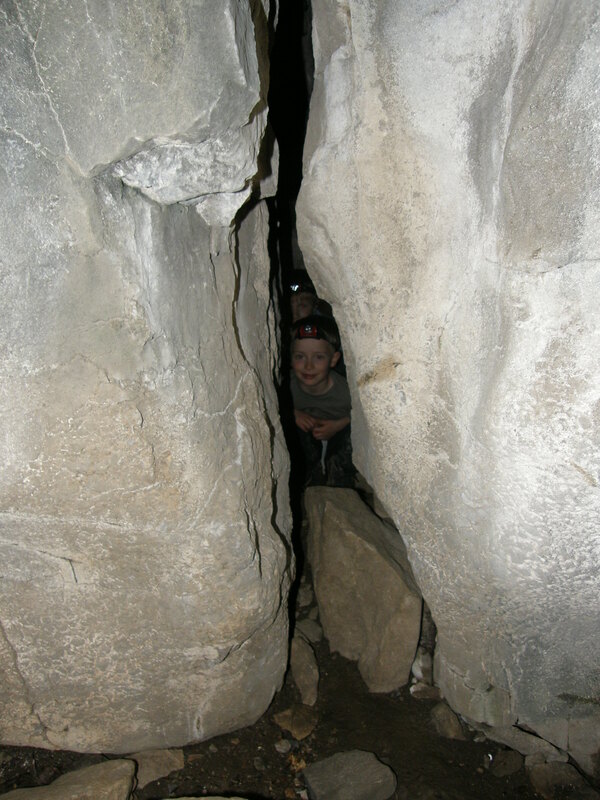 A’s feet were bothering her, so she and TBH headed back down to Settle, but the boys and I had one final appointment with another set of Caves. 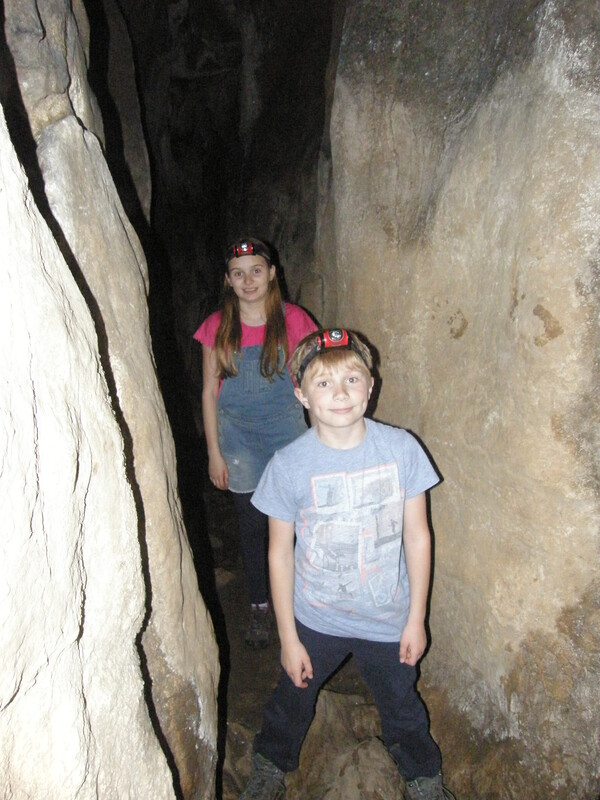 Jubilee Caves…. 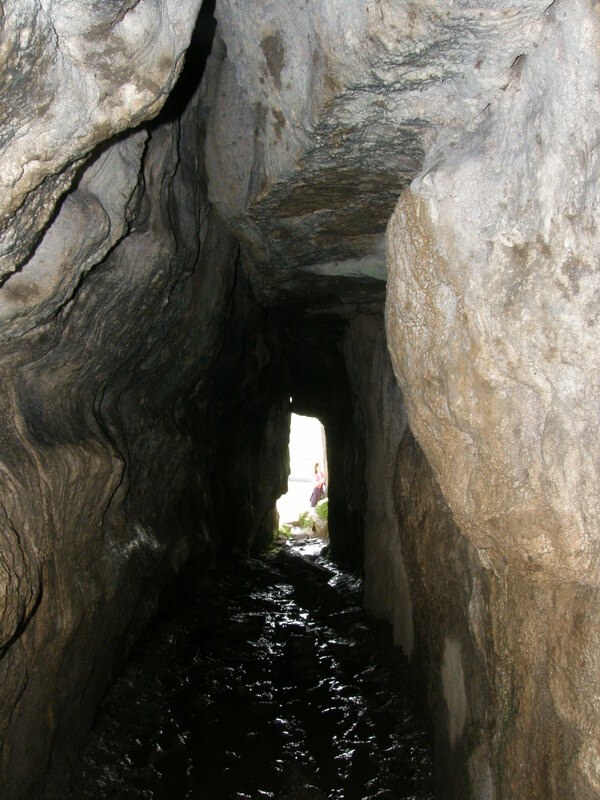 There are four small caves all connected. 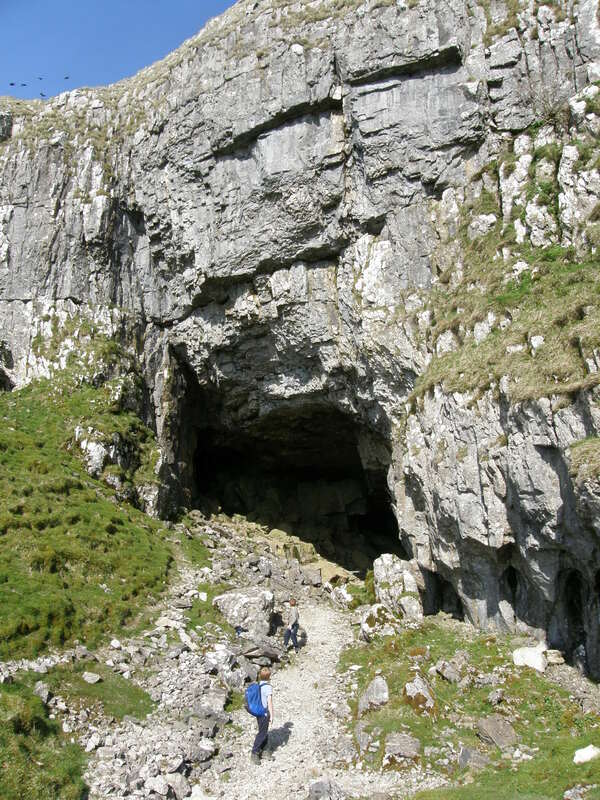 Or perhaps one cave with four entrances. As far as the boys were concerned this was the highlight of the day. 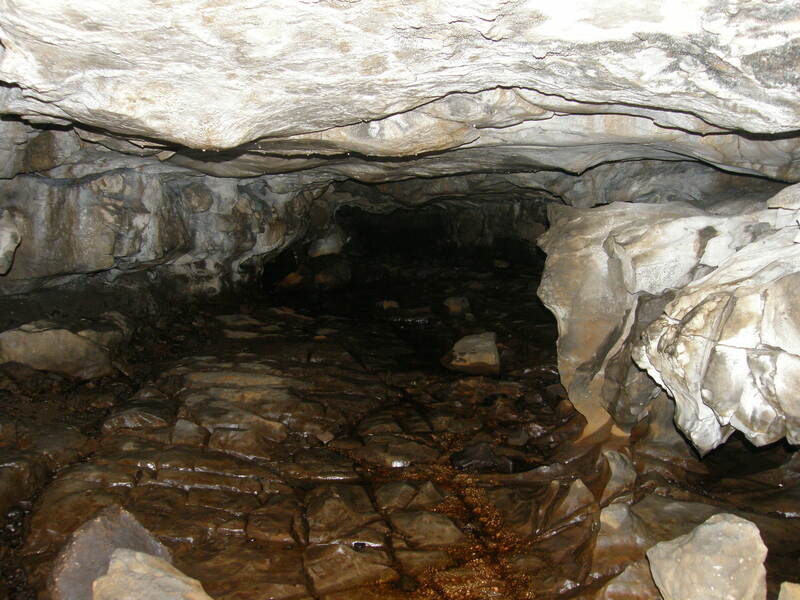 (I would plump for Attermire Cave). 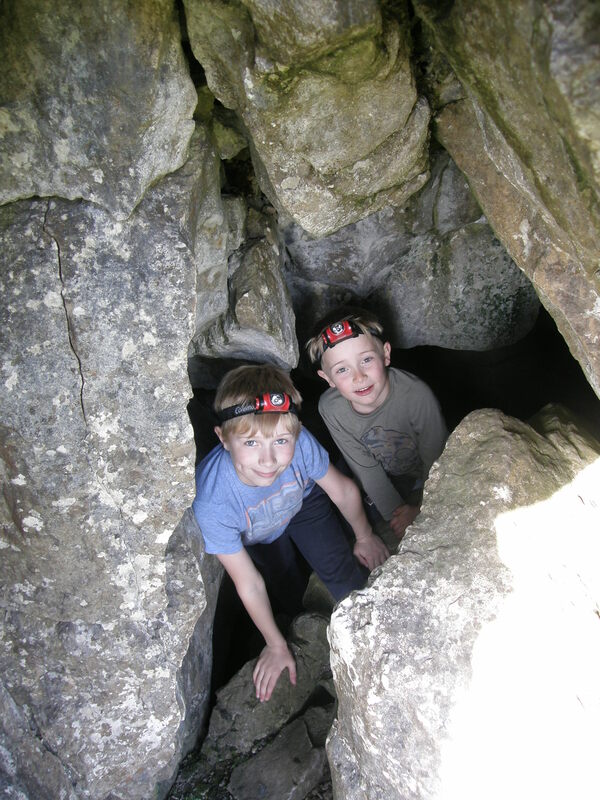 They loved exploring, waving to me through narrow gaps in the rock…. 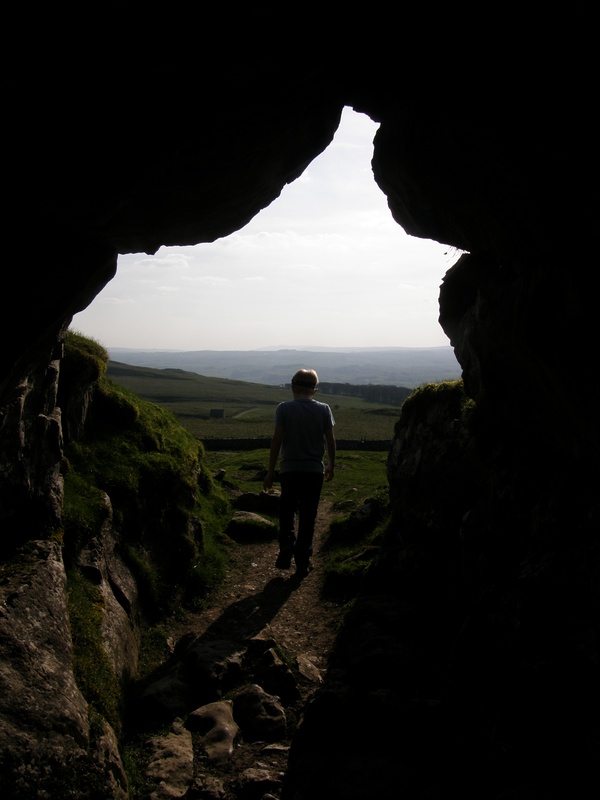 …wandering from cave to cave…. 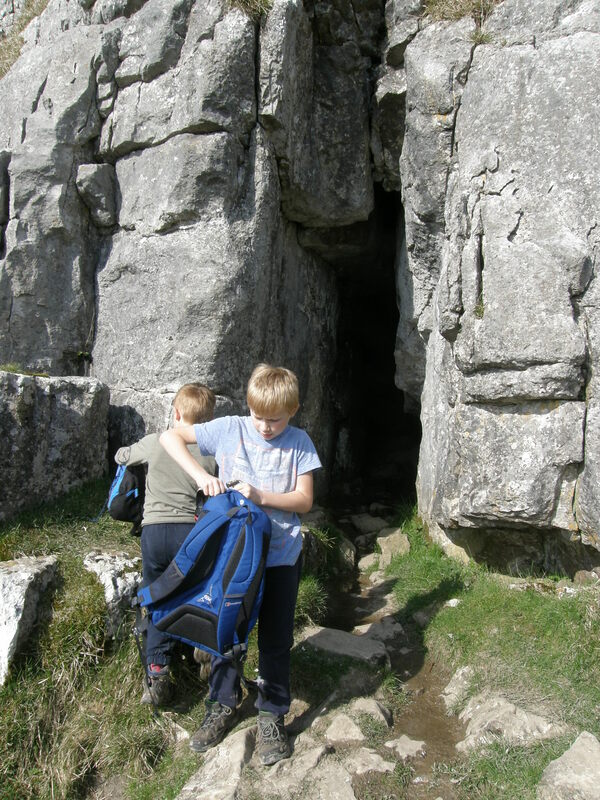 From Jubilee Caves we could see yet another cave mouth, which the boys were eager to check out. I also know that we missed Horseshoe Cave and Look-Out Cave. This is an area which we shall definitely explore again. 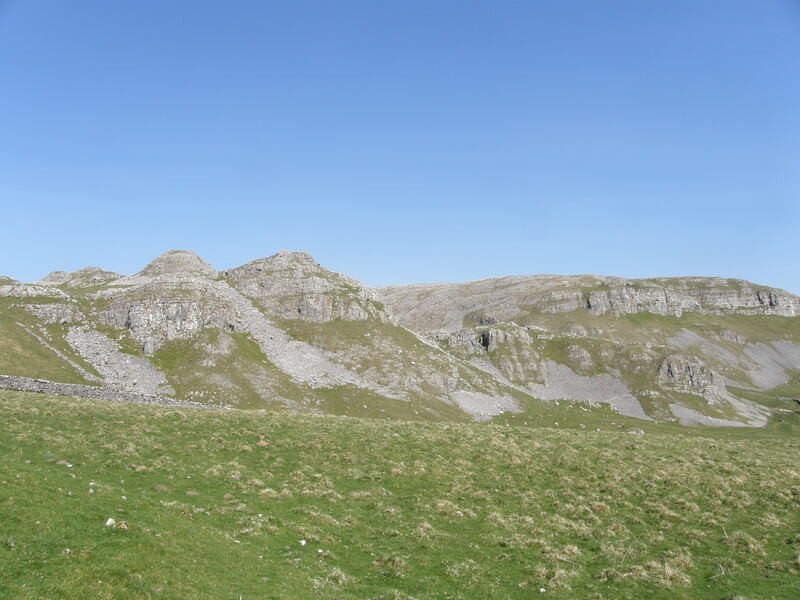 Even without the caves, the scenery is stunning and I’m amazed that I haven’t been here before, especially given the huge number of times I’ve driven past Settle on the A65. 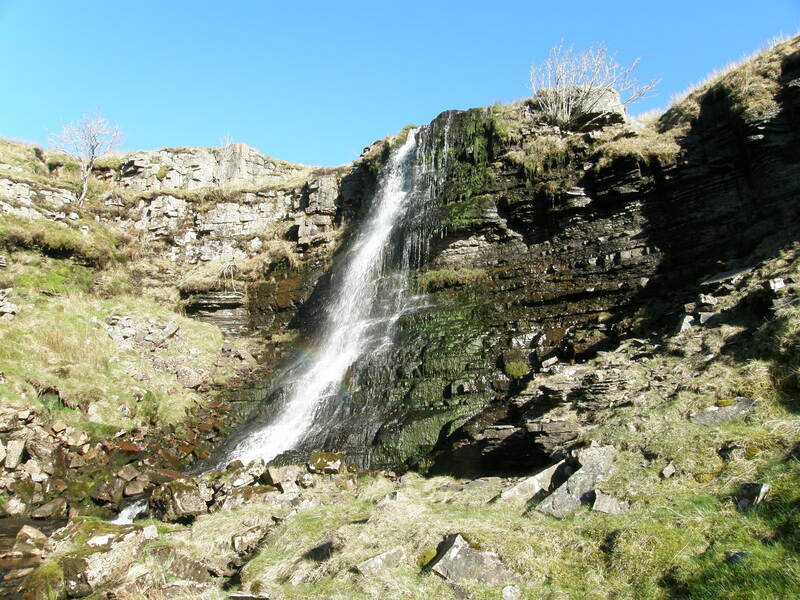 When we do come back, hopefully we’ll find time for a visit to The Folly…. 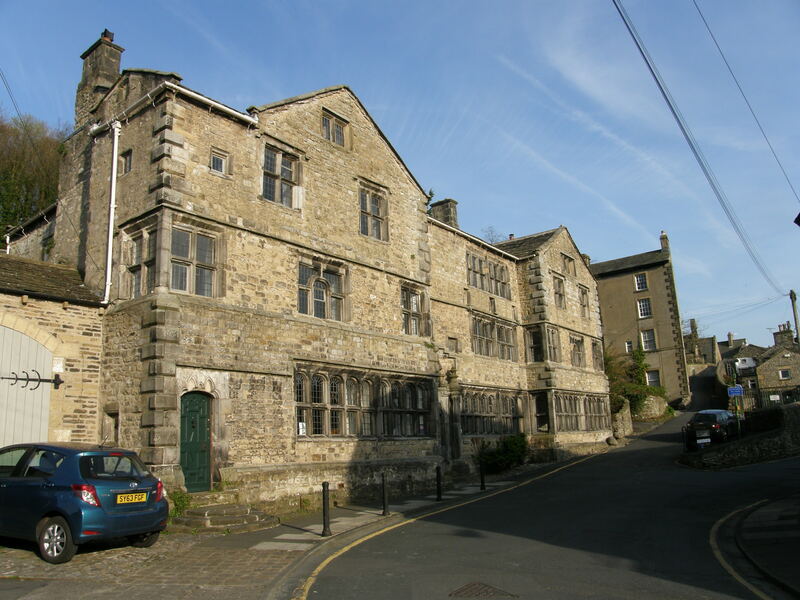 …which is Settle’s museum, and which last year had an exhibition on the finds from Victoria Cave – if only I’d known! The Genesis of this walk deserves a little explanation. 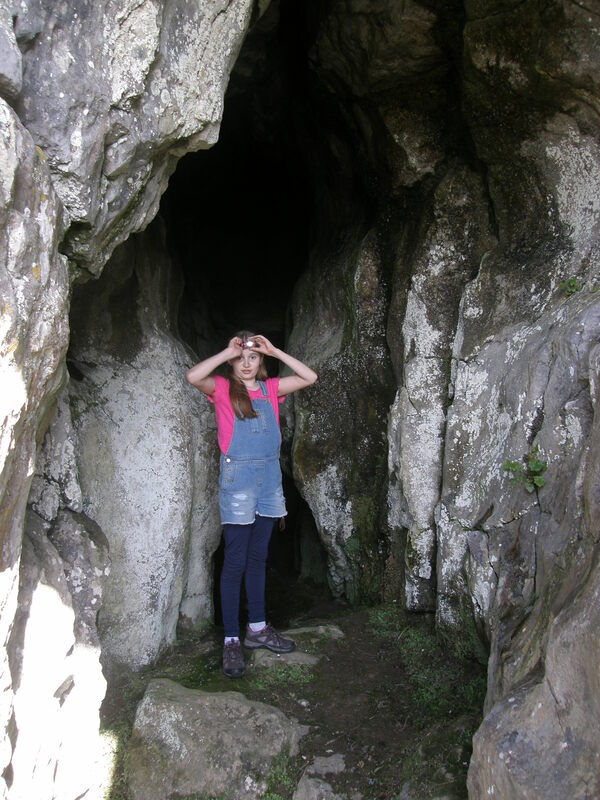 I’ve wanted to visit Victoria Cave since reading about it on the Teddy Tea Tours blog. …to review. I’ll do a fuller review soon, but here’s the edited version: it’s fantastic. 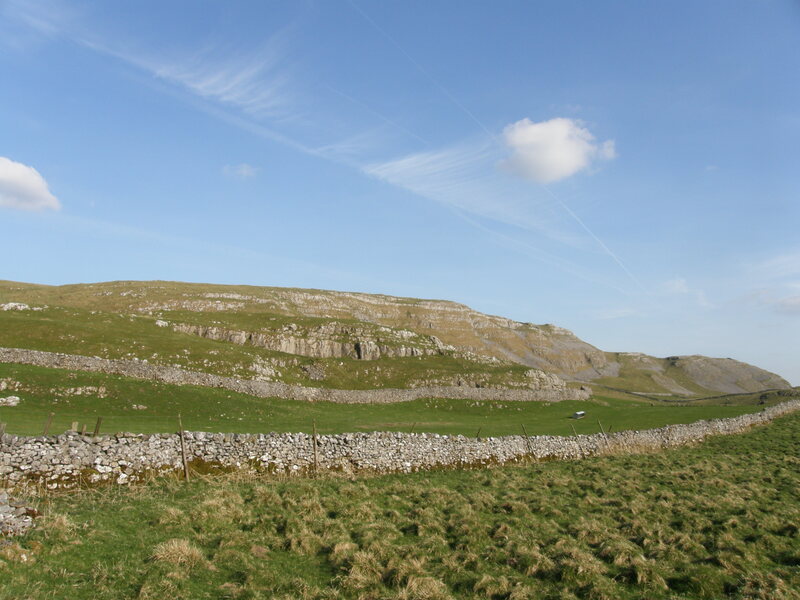 So much so, that I’ve become a bit Dales obsessed. This is Walk 30 from the book. 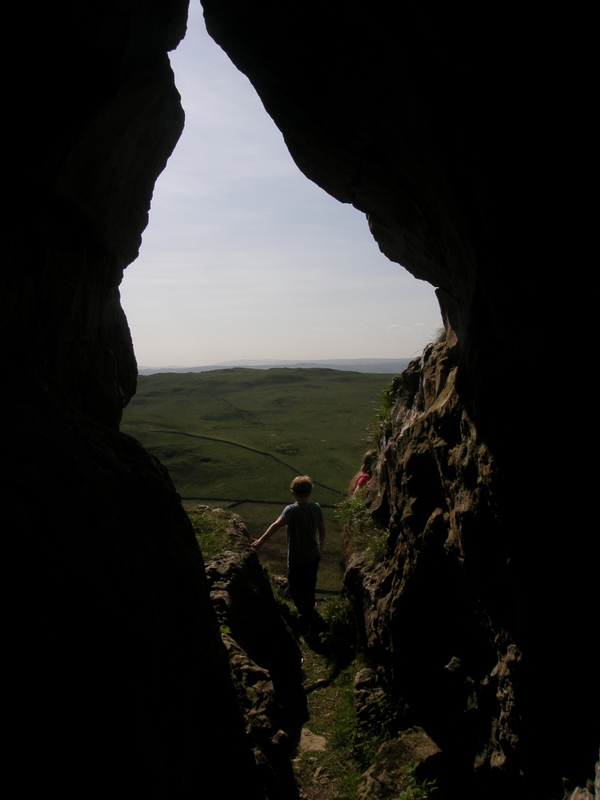 We’ve tried several other walks since then, so expect more posts, some with caves, to follow. 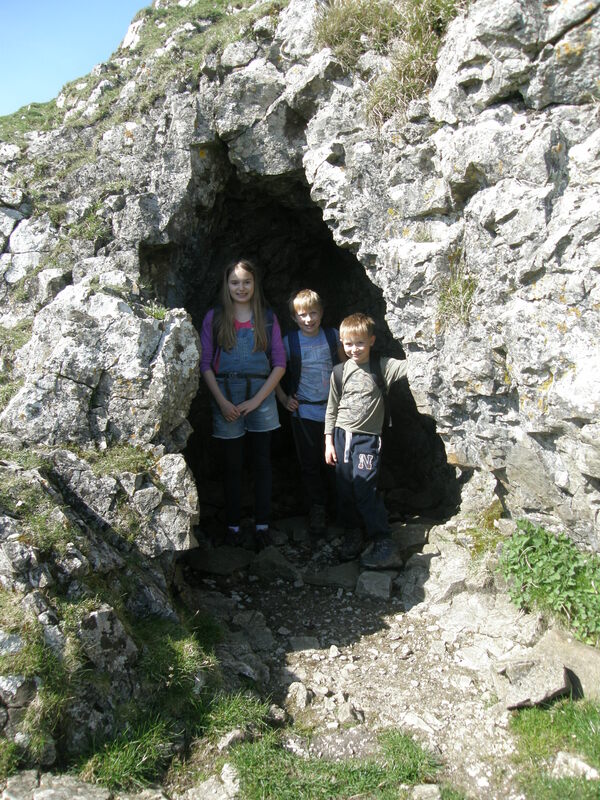 Having hit upon the idea of taking the kids to maybe poke around in the caves a bit, I wanted some up to date info on the safety and sanity, or otherwise, of that enterprise and discovered the fascinating and informative blog A Three Peaks Up and Under.